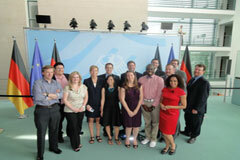 14 U.S. journalists participated in the 2-week Germany program. 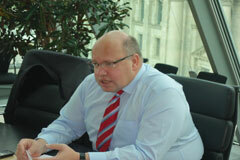 With Berlin as starting point they also visited Leipzig, Cologne and the EU and NATO in Brussels. Question from our producer during a recent newscast: Can you “adlib” something about the new loans to Greece and the debt crisis? My reply: Sure. And I’ll throw in something about NATO and the European Union. So — already I’ve been able to use what I learned on the trip directly during one of our newscasts. I’m sure there will be other opportunities — but I found it gratifying to know that I was already using what I learned. Additionally, several things still strike me from our two weeks in Germany. Like always, traveling reminds me of the common quests of all people. But I am now keenly aware of some differences in our cultures (and how they shape our “realities”) that I will carry with me for a long time. The degree to which the Second World War is still a part of daily life in Berlin shocked me almost every day. At the Ministry of Defense, we heard that theme come up over and over again as it pertains to today’s military policy. It makes sense in a way because Germany both lost and won World War II. No one we heard could or would argue that Germany was on the right side of that war. So the loss was a win that helped shape the country into what it is today. But it clearly has a strong affect on the country’s psyche that makes it a real part of life even in 2011. Berlin was by far my favorite city on the trip — one of my favorite all time cities period. I took from it a sense of atonement and progress that are intertwined. And, at the same time, a sense that some of the issues that lead up to the holocaust aren’t fully resolved. Our speaker on Turkish immigration made the clear point that so many immigrants to Germany are never allowed to assimilate into the culture in their lifetimes. Issues of race and belonging seem to still be a part of everyday life to an elevated degree even as we heard Germans repeatedly denounce the Nazis as killers. It felt like a very fine line at times between denouncing past atrocities — but dealing with underlying attitudes regarding race that may not have shifted as much as they could have in some cases. However, one of the striking things about Berlin is that its history is alive everywhere. Someone we met on our last day of the trip in Brussels said they were shocked at how little of the Berlin Wall was saved. I disagree. There are several places in town where it is being preserved. But its meaning — and the meaning of the holocaust are everywhere. The city literally seems to be living tribute to those who suffered. Specialized groups (i.e. gays) have a memorial where their particular suffering and slaughter was noted and a special commitment now to advancing the cause of equality because of it. A memorial to the gypsies (so many of whom were murdered) is being put together. Harsh and touching at the same time. The city has a real heart to it. Maybe not as cohesive a heart as some other big cities — but it’s getting there. As for the media we visited — the starkest differences to me were the simplest things. In our group, we talked for days about the concept for the two morning shows on national TV alternating weeks. It underscores the degree to which journalism is a business in the United States. Maybe from a pure journalism and resources point of view, the public is just as well served by the alternating model. I would think stronger competition would serve the audience better. But even when we asked questions about establishing your self as a news brand and competing head to head — the concept seemed foreign. It highlights the differences in the systems. The largely public system of funding media allows for a lot of in-depth coverage of big issues — and there’s an audience for it. I don’t think the American audience has that same appetite — and I think our hyper-competitive marketplace responds to that. After Berlin, the atmosphere of the trip (and the country) really seemed to change. In Leipzig, the theme to me was progress. Even the part they remember about their role in the end of East Germany is forward-looking. With the exception of the Stasi museum there — it is western society all around. They didn’t just step into it — they leapt. The old stores that once housed the market village now contain names like Mont Blanc, Gucci and Lacoste. Good restaurants, nightlife, etc. It seems as though the city is continually celebrating the progress it helped create. Cologne felt less and less a part of the history of post war Germany and more a thriving city. Clearly, there is plenty of “Old Europe” around — but in the brief time we were there the city felt different to me than any of the others. It may be a simple matter of geography — further away from the post-war division of the country simply because it always was clearly in the west. The city seems to have had more time to build its own identity. 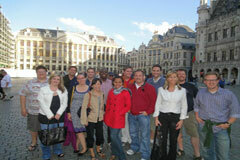 Our last days in Brussels provided great learning opportunities. As I said, the NATO and EU sessions have already helped me with my job. I had already been to Brussels so the city was not as much of a thrill as the places we visited in Germany. Still, it was a great time to cement new friendships around what we had learned, what we had laughed about (“follow me”) and what we had all seen together. Christina Cotterman, FOX News, Washington, D.C.
I’d like to start by saying the RIAS Journalist Exchange Program was everything I had hoped it would be and far more. 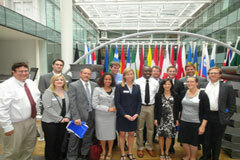 How fortunate it was that our two-week program took place at a critical time for Germany and her European partners. We had a front row seat as leaders grappled with major challenges on energy, foreign policy and, most especially, regional economics. As we explored the Greek economic crisis in more detail, I was struck by the unenviable position Germany found herself in. As Europe’s most robust economy — leaders stressed over finding a way to help stabilize Germany’s neighbors, without shaking her own economic core. Germany’s economy so far appears resilient amidst the region’s debt crisis. The economy is experiencing solid growth, driven by strong exports and a low unemployment rate. Delving deeper into the politics of Germany was fascinating. 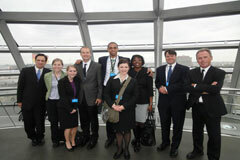 I especially enjoyed the tours of the Deutscher Bundestag and Federal Chancellery. While the U.S. political system is dominated by two major parties, in Germany there are several more with power — often requiring the formation of coalition governments. The current center-right coalition, led by Bundeskanzlerin Angela Merkel, recently raised eyebrows with decisions on the future of nuclear energy, and choosing to abstain from NATO-led military action in Libya. It was interesting to discuss this matter with a member of Mrs. Merkel’s own political party, the CDU, who considered it a mistake to not join the military efforts in Libya. I walked away from the Fellowship with a far better understanding of how the European Commission and NATO operate and the roles each plays internationally. These critical institutions will continue to have a major impact on U.S. policy and headlines here at home. Our talks with invited guests at NATO also provided key insight into the U.S. frame of mind with regards to the ongoing mission in Libya and the war in Afghanistan. While important to learn about Germany as she is today, many of the Fellowship’s highlights for me were learning about the country’s darker yesterdays. I was deeply moved by our tour of the Hohenschönhausen Memorial. The cells and stories of horror inside those walls were haunting, especially coming from our guide, who herself was imprisoned there. Leipzig was more than just a beautiful city with amazing churches (and great ice cream!) The city has a wonderful story to tell — playing a key role in the fall of communism in Eastern Germany. The walking tour took us to the very spots where East Germans bravely stood up for themselves, helping bring down their oppressive government. I also enjoyed taking a closer look at German reunification and the issues that still remain between the former East and West. There is no doubt the process has come a long way — as seen with the election of Angela Merkel of the former East Germany — but more still needs to be done. Perhaps one invited guest said it best when saying 20 years in and Germany has still not fully achieved inner unification. 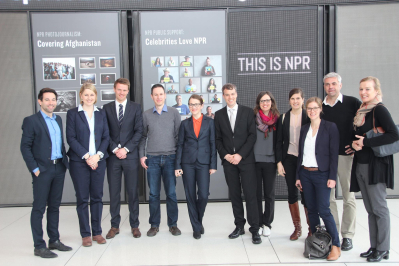 As a journalist, I truly enjoyed meeting and learning from members of the German media — as they helped us explore the dynamics of the country’s public broadcasting networks versus private media outlets. The public side operates primarily with the money collected through the monthly mandatory fee for each household with TV and radio. That compares to private stations which are financed only with advertising revenue. Despite that major difference, there is still a healthy competition for the largest market share of key groups. But after our visit with RTL’s Peter Kloeppel, it was easy to see how the respected journalist — coupled with the amazing station in Cologne — keep RTL at the top of their game! In summary, as I think back to each RIAS memory with a smile — I realize the Fellowship has only invigorated my interest in German affairs! There’s still much more to learn about Germany, its politics and people — therefore, I’ll need to be invited back…SOON! J… Vielen Dank und Auf Wiedersehen! So I’ll be honest and say the bar was set pretty high when I went on the RIAS Fellowship program. But as I quickly learned my passport was taking me on a totally different journey. 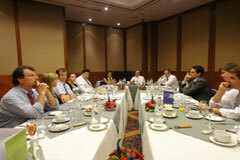 The Fellowship provided amazing contact with policy makers in the region. Going on a tour of a castle but sitting down with the German undersecretary of defense is equally as memorable. Or a meeting with a German network’s evening news anchor. I can’t say I had a sit down with Brian Williams on my last vacation. Because RIAS is so respected, I found that those we met with took us seriously. I participated in some great discussions, and heard “shoot from the hip” responses from those that we had appointments with. A good example that comes to mind would be the ARD Berlin bureau chief, who I held in high regard for telling our sizable group that German manufacturers would have to look elsewhere for an export market, as Americans could no longer “afford” their products. Of course this is just one person’s opinion, but again this was the type of candidness that only connected programs like RIAS can give. 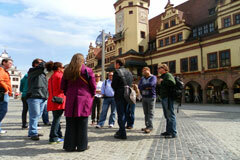 However because RIAS has years of experience the itinerary is finely tuned between the meetings and the sight seeing. You don’t feel overwhelmed, there is a sense that even though the idea is for you to gain professional context as it relates to Germany and the EU, fun does not go by the wayside. Since my return I’ve recommended the Fellowship to several colleagues who have all agreed that it sounds amazing. I put together a natural sound package for my department on RIAS, and I’m currently hosting two German RIAS Fellows who are doing the Europe to U.S. end of the Fellowship. Overall the RIAS Fellowship was very well run, I appreciated the great people we met with, the attention to detail on the part of the organizers, as well as the solid balance between meetings and more relaxed events. I hope to continue my association with RIAS for years to come. In the spring of 1975 I was backpacking through Europe. My traveling companion ran out of money and went back home to California. I still had a month left on my Eurail pass. After waving him good-bye from England I headed back to mainland Europe. One place I knew I had to go was Berlin. I grew up watching the news film that told the story of the Cold War and the building of the Berlin Wall in 1961. It was an incredible experience for a young college student to go through Checkpoint Charlie into East Berlin. I walked the mile or so past the bombed out area left untouched by the Soviets. I finally made it to the Soviet War Memorial. It was a monument of the victor in the most vicious war mankind has seen between two totalitarian systems. If the other side had won a similar remembrance would’ve been erected in Moscow’s Red Square. That image was in my mind. I made my first priority once I was settled in at our hotel in Berlin to go to Checkpoint Charlie. Fortunately, the hotel was only a few blocks away. I knew things had changed but the transformation from 36 years ago is breathtaking. When I saw this new united Berlin it crystallized in my mind how German society has changed since the Wall came down. That experience alone made the RIAS trip worthwhile for me. The remaining 11 days were a bonus. 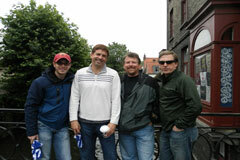 The June 2011 trip included educational, cultural and social experiences that our group will never forget. 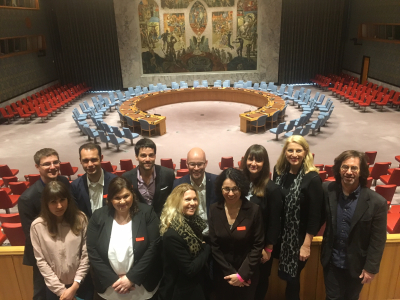 The combination of visits to media outlets and political organizations, cultural excursions and evening dinners in five cities over less than 14 days was a whirlwind. But once I got over jet lag the first few days I was having a wonderful time. The political briefings were invaluable. 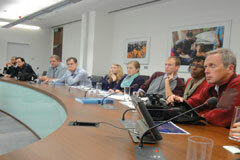 The visit to the Ministry of Defense helped with understanding the role of the Bundeswehr in the post-cold-war era. I sensed from the officer hosting us that the modern German Army wants to do its part in various Allied missions. But the military is concerned about getting involved because of Germany’s past. It became a theme to hear various hosts say a similar phrase about “how it should never happen again.” This mantra appears to be part of the German national conscience for the generation now in leadership roles in politics, the military and business. Their parents lived through the aftermath of World War II and obviously influenced them. 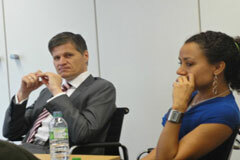 Another eye-opening experience came with our briefing from the Reuters reporter. The concept of politicians and others claiming the right to check quotes caught the American audience off guard. German news organizations could refuse to share the quotes prior to publication. But as it was pointed out, it could be a very dicey situation if a politician wanting to check quotes is constantly turned down. The reporter needs to have a long-term relationship with them. I was glad to hear from other reporters in Germany that this practice is random and some reporters and organizations refuse to indulge politicians in previewing quotes. One such German reporter was among the group of three broadcast journalists I joined on our “Friday night date.” Besides seeing Checkpoint Charlie, the evening with the reporters was my most enjoyable experience on the trip. The three reporters included: my main host (a political reporter), the person staying at the 10th story flat where we met at (a radio reporter who covered the U.S. presidential election) and a presenter from the same television channel where the political reporter worked. The radio reporter cooked a tasty meal for all of us as we discussed everything from the geopolitical situation to day-to-day life in Berlin. The main host is the daughter of the former German ambassador to the U.K. and her Great-Uncle was the Chief of Staff of the German Army during the Franco-Prussian War of 1871. My Great-Grandfather was a foot soldier wounded in that same war. It is indeed a small world. 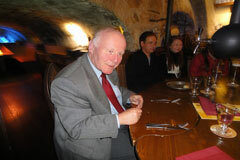 Also in Berlin, we had an interesting lunch that most of the RIAS Fellows probably wished had lasted longer. A Turkish member of the Berlin Parliament provided us a peek at the problems former immigrants face as they try to assimilate into general European society. What he shared about his Turkish community within Berlin was fascinating. I’m glad we visited Leipzig and Cologne. 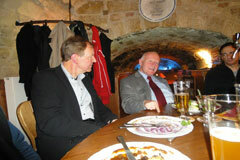 In Leipzig I had a chance to join a former student of mine and her husband and others for dinner at their apartment. This gave me another personalized experience similar to the dinner with the reporters in Berlin. I didn’t know much about Leipzig other the city is home to a great university. Only on this trip did I learn that Leipzig was where the peaceful protest movement in East Germany started at a Lutheran church in the city center. Also, I learned for the first time that the American Army occupied the city from April to June 1945 before having to turn it over to the Soviets. Like the entire trip this was a humbling experience. Only when you actually visit a country can you truly learn about its past, people and culture. In Cologne I was enlightened about the old Roman city. The Roman history we study in U. S. school usually stops at the Alps. I knew very little about how the Rhine served as a natural barrier between the Romans and the Germanic tribes. The final few days in Belgium turned us more into tourists of sorts. But that was ok with me. I enjoyed our boat ride and train rides. Those Belgian waffles are special. 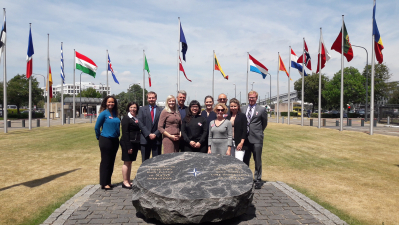 But we still had time to get in visits to the European Union and NATO before heading back to the U.S. From the standpoint of being journalists these sessions (along with the time at the Reichstag) were the most informative. We had some very candid briefings from officials about the status of the Euro, the Greece situation and Libya. I left much more informed about issues I thought I knew a lot about but realized how little I truly understood them. I’ve wanted to take part in the RIAS program since the late 1990s. After having knee replacement surgery (both knees!) over the last three years, I was ready to apply again. I’m grateful to Rainer Hasters and Jon Ebinger for selecting me this year. The trip is an experience I’ll always remember. 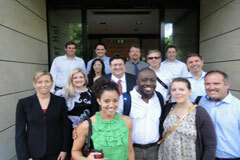 I look forward to hosting another set of German journalists at the University of Oklahoma in 2012. When we host the journalists it’s a win, win situation. 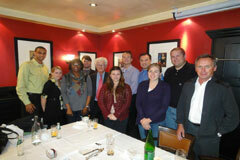 It’s great for our students, the journalists and the media professionals they visit in Oklahoma City. And finally, I’m grateful the RIAS staff is flexible and allowed enough free time to create some of our own experiences. Rainer, Isabell and Lisa are generous people and very giving with their time and insights. They represent their wonderful country well. I only hope they feel the same about us Americans. I am a huge Rap Music fan. Besides The United States, Germany and Japan are the biggest markets for Rap Music in the world. Germany’s obsession with Rap Music came to my attention more than a decade ago, and it is probably the piece of trivia I knew best about the country before attending RIAS Berlin. I remember when I first learned this information, I was totally floored: Like seriously? They are crazy about Rap in Deutschland?!?! I was always curious to know what that experience would be like, and always hoped to get to Berlin in order to find out. It was on my bucket list, but not at the top. I guess I always imagined I’d get there, but I never knew when it would happen. As time went on, I met lots of German friends in the States (I once lived in Orlando, and bumped into quite a few Disney World Tourists.) They always picked up at the fact that I had a curiosity about Germany, which usually prompted people to tell me; “you should really go over there — you’ll love it.” After years, and years of having that conversation, I finally got the opportunity to go this spring. German-born Basketball player Dirk Nowitzki led the American Basketball team, The Dallas Mavericks to an NBA title on June 12, 2011. I arrived in Berlin on June 13th, and my first memory of Berlin was seeing a huge poster with his image on it. That was weird, because it wasn’t what I expected my first impression to be. German’s were proud of his accomplishment. Nowitzki is the first German-born player to win an NBA title as The Most Valuable Player. It was kind of a big deal. In a way, I guess in its own way, it was an accomplishment that sort of symbolized how a place with SO much history is changing the way the world sees it and how it sees itself. I had been in Berlin for a day or two, and most of the signs that I had seen, seemed foreign to me (besides that one.) It was probably a result of a sensory overload of words I hadn’t seen before. I had never been out of the United States, and I felt like a baby who opened his eyes for the first time. I had a cartoonish awareness of what I believed Germany to be: (Heidi Klum, Hogan’s Heroes, Samson the Bear on Sesamstraße, Wetten Dass, Knut the Polar Bear, and Oktoberfest.) Joking aside, besides the obvious things we learn in American History books, I soon began to find out that Germany had a lot of character. Berlin itself was hip, colorful, and graphic with graffiti on every surface that could be painted. The city excited me, even though I didn’t know where I was most of the time, I wasn’t worried about my safety. It had electricity that I imagine New York City had in the 1980’s. I was vaguely aware of Germany’s history, but a bit ignorant — a lot ignorant — to how much of it still shaped modern society. Considering that The Berlin Wall has only been down for 20 years — a unified country is a relatively new concept, still weary with growing pains (but hey, they now have an NBA-MVP!) As the RIAS agenda began, I started to understand how and why a society that began centuries ago and went through its amazing revolution and social change over hundreds and hundreds of years ended up being Brooklyn, New York circa 1989. I could discuss going to the Federal Defense Ministry (because I really loved it), or visiting Reichstag (because it was a really unique experience), or going to the U.S. Embassy, traveling to Brussels (a new place that I have fallen in love with), visiting NATO headquarters, or the European Union… but I won’t… because everybody else will. You’ll never understand the true, personal impact RIAS Berlin had on my life if I don’t bring it back to my first love. My defining moment in Germany (possibly even Europe) came randomly on the last Saturday Night we spent in Berlin. True disclosure: I felt like a week had gone by, and Berliners had collective grown tired of us “Americans” who seemed to always be in a loud and “annoying” group in their eyes. I imagined many probably wondered why we’d take pictures of things so mundane, like Bahnhof signs. At this point, my energy was a bit low, I was a little homesick… with a week to go in Europe, I felt like I had already worn out my welcome. 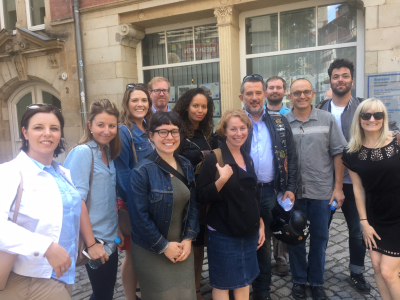 Luckily, a German based-RIAS Fellow, named Hanna Ender wanted to show a few of us American Fellows a good time in her home town. She ended up taking us to a German “Clubrestaurant” Spindler & Klatt. Apparently a “Clubrestaurant,” as all of the travel guides call it, is a restaurant that removes its tables after a certain hour and becomes a dancehall. It was kind of a fascinating building, it was rather nondescript on the outside, possibly even kind of seedy (in a good way) and industrial. (I later found out it was built in a former factory), it’s now well designed and highly swanky on the inside. It was a huge place and in the main room, the DJ was playing rap music. Not just rap music, but CLASSIC RAP MUSIC from my teenaged years. I’m 34 years-old if that tells you how “classic” the music was. I was already a little-bit mesmerized by the idea of it all… but this was the Germany I had always imagined. I was immediately sold on the experience, and I was more than ready to indulge the moment I stepped in. I think I even annoyed the staff by dancing before they moved all of the dining tables out of the room. Once the dance floor became established, I think my over-enthusiasm attracted people to the floor much earlier than they normally would have. Apparently, Germans start to arrive in earnest around 2AM, and it was probably only 11:30 or midnight. Besides the other RIAS Fellows that came, I was the only American in the room. Most of the people didn’t speak English the way I did, and my Pigeon German didn’t go over so well. But the amazing part of the whole thing was that I wasn’t the only one reciting the lyrics. I wasn’t even the only one who knew every word to every song. Each song was my favorite song, and the next song was more favorite than the previous one. I loved the music, I loved dancing, I loved the crowd, the crowd loved me and my dance moves. Berlin became this amazing love-fest. It was the coolest thing I’ve ever experienced in my life. I got hugs and handshakes by a lot of kids who were totally different from me, but liked my style. I liked theirs too! Everyone in the room was equally in love with the same thing. At that time, I was not American, they were not German. We were all the same… very sweaty Rap Music fans. Any fundamental differences and language barriers that may have existed, any culture shock or misunderstandings that happened to me in Germany prior to this moment were completely gone. For the first time, I honestly did not feel like a stranger in a strange land. I was on top of the world. Just like the song says… The world was mine. Beneath a nearly cloudless blue sky, 58-year old Vera Lengsfeld remembers a very dark past. Nearly 25 years ago, she was a political prisoner at Hohenschönhausen, Berlin’s notorious Stasi prison. On this day in June, she leads our group of visiting American journalists down the hallways that once contained her world. Aside from the outer barbed wire walls closing us in, the compound could easily be mistaken for an old hospital. Roses now bloom at the site where prisoners were humiliated, interrogated — even tortured. Like most of the guides here, Lengsfeld has first-hand knowledge of what happened. Arrested as a peace activist in 1988, Lengsfeld spent only a month at Hohenschönhausen before she was exported to the West. Leaders in the former GDR wanted her out. Yet she returned to Berlin the following year, and it was that return that made her personal story so strange and complex to me. Lengsfeld would learn that her husband, the father of her two children, was a spy. He had prior knowledge of her pending arrest, and he could have stopped it. Though the two divorced, the story represents for me the internal, conflicted struggle that Germans still have. Despite the country’s economic and social success which we saw first-hand during our visit, we also saw ways in which history continues to be a burden. Ghosts are not at rest. Just what to forget and who, if anyone, to forgive can weigh heavily upon members of the population. Throughout RIAS, it was difficult to believe this had ever been such a land gone wrong. We visited ZDF’s “Morgenmagazin” and the newsroom of RTL’s “Aktuell” and could appreciate the sophistication of German television in both public and private sectors. 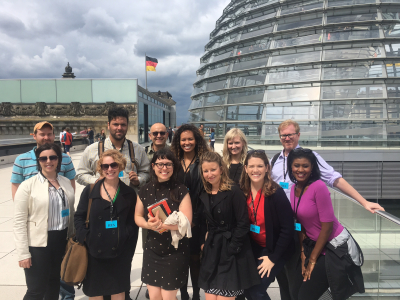 We toured the Bundestag, where we had a taste of how the democratic process now works. We even visited our embassy, where the U.S. 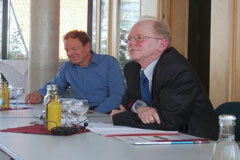 Ambassador assured us of the healthy state of German-American affairs. Yet we also visited Benderblock, where Hitler’s July 20th conspirators were executed. We met a member of the Green Party who spoke about the shortcomings in Germany’s relationship with its Turks. In my free time I visited Wannsee, and stood where high-ranking Nazi party members decided on the “final solution.” On one rainy Saturday I also visited Sachsenhausen, the Nazi concentration camp where tens of thousands of prisoners died. Put together, it is difficult to make sense of all these contrasting experiences — experiences I would have never had without the exceptional guidance of Isabell, Rainer, Lisa and Hildegard. And I sensed in Vera Lengsfeld’s deep blue eyes on that summer day with our group that the process never really ends. As we stood together at Hohenschönhausen, I tried to make sense of a time that never really made sense. Today Ms. Lengsfeld is active in politics and a conservative voice in Germany. In her lifetime, she has been both embraced and betrayed by her land. Hardship has made her what she is — just as it can hopefully make her, and her country, ultimately better. Hers is one story of many that should be remembered, and no program allows American journalists to understand that better than RIAS. 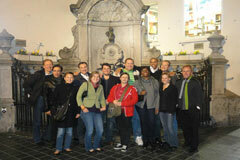 My recent RIAS Fellowship experience in Germany and Belgium reshaped my world view. I developed a new respect for the perspectives of other countries, and saw how those perspectives can differ from those in my own country. At the same time, I learned how economically and politically connected we all are, despite our differences. And that was just the tip of it. Our trip opened my eyes to events in history to which I had never really given much thought. Communist oppression became real as I walked through the neighborhoods of East Berlin and Leipzig. The horror of the Holocaust came to life as I recorded video on a tour of Sachsenhausen. Actually, Germany’s history often scared me, yet it also allowed me to appreciate the kind of hell from which the country has returned. To see Germany today, it is as if it never happened. By far, our time in Berlin was my favorite part of the program. Germany’s capital is an amazing city full of art, history, politics, food, beer, and the best of all — conversation. I was impressed with how engaging the people were and how much they engaged me, despite my limited language skills. History and art were also interesting, as I saw both old and new blended before my eyes. The Reichstag and Potsdamer Platz were two places where the past and present architecturally came together, and I took plenty of pictures. There were many special days. 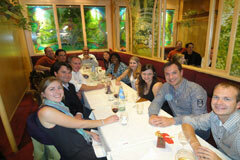 One of the most special for me was the first Friday, when we visited a Turkish restaurant called “Veli’s”. We ate with a member of the Green Party who was of Turkish descent. While enjoying Turkish food for the first time, I learned about the very distasteful relationship that still exists between Germans and Turks today. The fact that RIAS did not try to hide this reality, and that they even scheduled the lunch in the first place, impressed me. Ask anyone from our visit and they will tell you that I was not the “talker” in our group. Still, that did not stop me from learning a lot from our talks. I heard from politicians and journalists, and realized we all share a kind of idealism. What we do really isn’t all that different. Delivering the news in Austin is a lot like doing the news in Berlin — and that was eye-opening. Berlin and Austin are both capital cities, and our visit to the Reichstag gave me flashbacks to covering stories at the Texas State House. As for the people we met, Vera Lengsfeld was among the most fascinating. Her tales of Stasi prison life moved me. We stood in rooms where people were tortured, and I could not believe what I saw, heard and felt. To know these things happened in the name of politics helped me to better understand the depth of suffering that the German people have now been enduring for decades. There is no way that I will ever be able to forget these experiences — or to thank RIAS enough for them. At the same time, I cannot wait to go back one day and to learn even more. I found the program immensely interesting and useful. I had been to Berlin briefly once before, but having the better part of a week to explore this fascinating city was a real gift. Between the journalists who spoke to us (German and American, from print and broadcast) and the officials (Bundestag, Defense Ministry, U.S. embassy), I feel as though I got an amazingly well-rounded overview of German politics, economics, media and history. Perhaps my biggest impression came from Berlin. 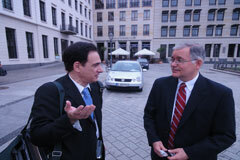 We had off-the-record briefings with a highly-placed official in the CDU, as well as another in the Defense Ministry. While answering questions about recent political and diplomatic events, both said that Germany was hindered by the lingering impacts of its Nazi past. Both said the German people were extremely leery about their troops being deployed outside the country, and that they refused to allow German soldiers to be sent to countries which had once been occupied by the Wehrmacht (one suggested this was a major reason behind Germany’s decision — unpopular in the U.S. and the rest of Europe — to abstain from the UN Security Council vote to intervene in Libya). The defense official said in general, Germans don’t see the military as a particularly prestigious or even honorable career. The lesson for me was that — nearly seventy years after the end of the war, that history continues to reverberate, continues to effect how Germany goes about its business. It makes one pray the world learned a lesson that won’t have to be repeated about the appalling costs of excessive patriotism and blind obedience to authority. Not all of our experiences were quite so somber and serious. We spent a night at the opera in Berlin, had a lovely meal in the cellar in Leipzig where Goethe drank as a law student in 1765, and had time off to explore Berlin, Leipzig, Cologne and Brussels (I rented a bike in each city and went poking around on two wheels…). 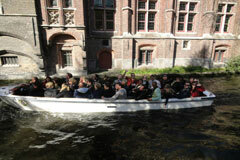 We also spent an afternoon in Bruges, including a boat tour of the historic canals. I consider my RIAS Fellowship to be a highlight of my journalism career. I’d recommend it to any mid-career journalist looking for a way to get out of their habitual mind-set and expand their perspective. The two weeks I recently spent in Europe for the German-American Journalist exchange program, far exceeded my expectations. I was extremely impressed by the people, government, media and the culture of Germany. I am of German decent but I always assumed that the generosity, pride and other traits of my relatives were unique to my family. I now know otherwise. I was taken aback at how kind the people as a whole were to us United States citizens. Shortly after arriving in Berlin, another Fellow and I went over to view the Checkpoint Charlie area and an elderly gentleman thanked us both for America’s part in bringing down the Berlin Wall. We were both stunned to hear that the locals will do that from time to time. I also sensed a large amount of pride from the German citizens, in the way that they spoke of their country. Another trait that hit close to home for me was the frugality of the German people and their responsibility when it comes to money management. There just isn’t the idea of having to show off your financial status, like in modern day America, where people put themselves into debt to keep up with their neighbors. There is an overall feeling of uneasiness that exists in the United States today because of the poor economy. I did not get the same sense from the German people. It appears at this time that Chancellor Merkel’s ways of handling the recession (her decision not to do massive bailouts and add more debt) may have been correct. The Germans have rebounded much faster from the global economic crisis. The concern instead, is the problems that exist in other European countries which are impacting the Euro. Despite challenges like these, the government appears to make it a point of looking out for the German citizens. Their policies for handling such things as unemployment, healthcare, and childcare are impressive. The German and American media have both similarities and differences. The structure of the news and the newsrooms are very similar. It was interesting to see how the layout and the contents of both the magazine shows and the daily newscasts parallel ours in the United States. The major difference that I observed was in the philosophy of news. The German people have the same ideas that we once had in that the better the content the higher the viewership. They have large budgets and their product benefits by sending people all over the world with two or three person crews working on a story. It brought back memories of the way we worked over a decade ago. 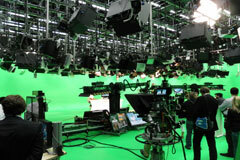 Today American television stations have cut costs and are continuing to look for ways to cut more. The means of survival amongst our affiliates is to do more with less, even if it means a lower quality product. There is more of a relaxed attitude in Germany, they spend less time working and take more time for vacations and leisure. I was surprised when I got up early each day to run that the cities were still quiet, unlike America where people are always going non stop around the clock. Overall, I felt very comfortable in Germany because I didn’t find it drastically different from the United States. My biggest surprise was how much I loved the country. I can’t wait to go back to Germany again someday! 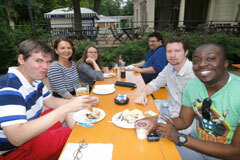 My two-plus weeks in Berlin as part of the RIAS program was undoubtedly the highlight of my year. 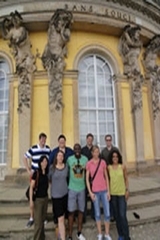 While my undergraduate studies were in European history and I felt fairly well-versed in the current state of European, particularly German affairs, the program gave me amazing first-hand experience and knowledge about the rapid and extensive changes taking place in modern Germany. What made the program most satisfying and wonderful, of course, were the amazing array of accomplished RIAS Fellows and the warm and welcoming (and also deeply knowledgeable) RIAS staff. Starting out in Berlin, I was able to move about the city and meet people who provided a first-hand look at the incredible changes taking place right now in Germany. The eye-opening experience revealed what an incredibly vibrant and rapidly changing place Berlin is right now, how this city which was so ravaged by war and the cold war divisions, has really come into its own and is now a cultural center for all of Europe. 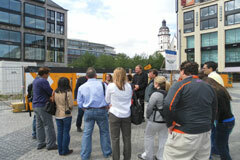 The guided tour we were given on one of our first days in Berlin was fantastic. But just riding a bike (so easy to rent!) or walking around Berlin was a thrill, but so was meeting the many interesting people in media and government who were part of the RIAS program. One of my favorite meetings in Berlin was the morning we got to watch the taping of “Morgenmagazin” at ZDF headquarters. 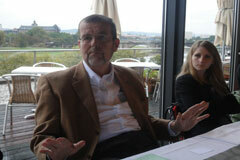 We sat down for a long, satisfying time with Mr. Thomas Walde, the deputy head of ZDF. 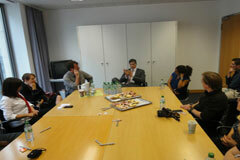 We discussed the nature of German News, including how it works, how they deal with various national issues and politics. Mr. Walde was extremely generous with his time and over the course of the almost two hours we spoke with him I learned a great deal about the differences between the U.S. and Germany. In particular, I learned that the average German citizen seems far more engaged in daily political discourse than Americans. He suggested that the reason for this was a more singular culture in Germany than exists in the United States, that most Germans care about the minutiae of German politics and are passionate about issues. Mr. Walde worked for a long time in the United States and so his ability to articulate the differences between German and United States media was particularly effective and educational. Another excellent presentation that I found very interesting and refreshingly frank was the conversation about German foreign policy with Mr. Peter Altmaier, the first parliamentary executive director of the Christian Democratic Union parliamentary group at German Bundestag. The issue of the day while we were in Berlin was Germany’s refusal to participate in the U.S./European effort in Libya (which has since proven successful). Mr. Almaier admitted this was a mistake, an amazing bit of candor for a politician. 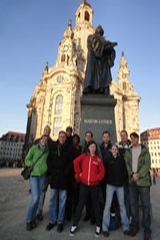 The meetings we had were extremely informative and often fascinating, but one of the great things about the RIAS program is how much effort is taken to immerse the scholar in German life. It’s one thing to sit down in a conference room to discuss the issues of the day, but to spend time out in Berlin, watching arias by Puccini and Verdi at Konzerthaus am Gendarmenmarkt or to sample white asparagus at one of the city’s finer restaurants. 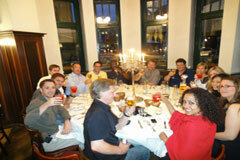 I loved spending time with the other RIAS scholars, having meals and drinking excellent German pilsner. I would especially like to point out that the experience was enhanced significantly by the participation and leadership of Rainer Hasters. Rainer’s vibrant sense of humor, his impeccable organizational abilities and his deep knowledge of German history and current affairs made the program so fulfilling. At every stop he masterfully corralled all the RIAS scholars and was superb at answering questions and entertaining the group. I cannot speak more highly of Rainer, his participation helped make my experience in the RIAS program the highlight of 2011 for me. It is a program that I will highly recommend to my colleagues at the New York Times and will certainly never forget. The first time I touched down in Berlin it was the middle of December, ten years after reunification. The city I saw out my bus window was one undergoing massive reconstruction and renovation. Potsdamer Platz was still being filled with high-rises, the Brandenburg Gate was covered in a cloth and what’s now the Topography of Terror was full of trees. The bleached winter light made everything seem unreal; it was as though I had stepped out of real life and into a movie. The second time I found myself in Berlin, on my first RIAS Fellowship, Potsdamer Platz was completed, the Brandenburg Gate was again open to the public and the American Embassy in Berlin was just a pit and an idea. The Berlin of 2005 was a city thriving, a city that was beginning to settle into its identity as the reunified Germany’s capital. This time, my third, I found myself standing in places in Berlin that should be familiar and yet were not. I found myself disoriented in a way I had not expected. There were cafes where cafes had not been before. There were buildings where there had been vacant lots and vacant lots where once buildings had stood. A neighborhood I had gotten to know well in 2005 was completely new to me in 2011. That, for me, was one of the takeaways of my second RIAS experience, this feeling of Germany being in a state of transition — its architecture, its cities, its policy and even its people. Not only are German spaces changing, German identity is also beginning to shift. It is not a shift that will happen quickly but many of the speakers we met with seemed to think in the near future identity in Germany will be more fluid. Hybridity will be embraced — some speakers suggested it must be if Germany hopes to remain the economic giant it has become. All this change, of course, takes place against the backdrop of German history. During a tour of the Defense Ministry’s facility in Berlin, we saw the Bundeswehr memorial. A memorial to fallen servicemen that is both the property of the military and the public — a reminder that the German army is the people’s army, that soldiers are citizens in uniform, we were told. A contrast to what the German army has been in the past. The nation’s history, we heard in meeting after meeting, informs much of what the Germany of today does — on the domestic and foreign fronts. This, the past being so present, was not so different, this I had heard before. And I found myself wondering, again, how long Germany can continue with past and present so interwoven? How does this dance of past and present affect how Germans understand what it means to be German? Of course RIAS gives Fellows the opportunity to ask these questions of Germans themselves. Those interactions, with politicians and journalists and other people living in Germany, are among the strengths of the program. It’s one thing to be lectured at about particular issues but the chance to actually have conversations with individuals about those issues is rare. Those conversations, over breakfast or beer, are among my favorite aspects of the Fellowship. The responses tend to be candid and off-the-cuff and, while they aren’t always on the record, they certainly give Fellows a more rounded understanding of what’s happening in Germany at the moment. 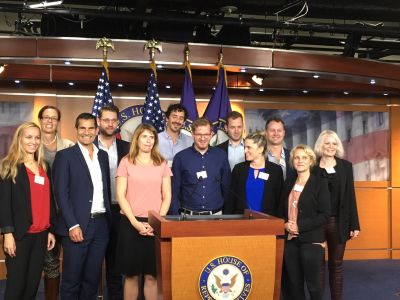 But it’s not only the ability to talk to Germans about their lives that made the Fellowship a fulfilling experience for me, it was also the chance to chat with other Americans working in, or studying, the news industry. We’re all aware of the stresses and pressures incumbent upon journalists working in broadcasting in the United States today. Facing deadlines and news holes and rushing to get a story first, journalists seldom have the time or luxury to sit down and simply talk to others in the industry. Whether it’s sitting in the middle of the Grand Place late in the evening, singing along to 80’s songs in a tourist bar or celebrating the summer solstice in a café along the Rhine the opportunities RIAS provides to Fellows to simply inhabit the same space as other journalists, the chance to blow off steam with other journalists, is invaluable; it both invigorates and grounds me and is one of my favorite parts of the RIAS experience. Each experience I have with RIAS serves to reinforce, for me, the importance of such Fellowships for journalists. It opens up individuals to new ways of seeing and understanding the world and gives them new perspectives on debates and situations back in the United States. It also gives them the chance to hear how others working in the industry are coping with the changing American media environment. If I could return every six years I would. RIAS has a frequent Fellow card, right? Jacqueline Pham, FOX News, Washington, D.C. Since the debt and banking crises surfaced in Europe, the U.S. press has been reporting that the Greek debt case would test the Eurozone and the eventual doom of the currency. Such pessimistic outlook was the opposite of what the speakers at the European Commission had conveyed. Europeans believe in saving the euro. Just a month after the RIAS group returned to the U.S., Germany and France took the lead and forged a plan not only to rescue Greece for the second time but also to assist the entire region should other countries follow in Greece, Ireland and Portugal’s footsteps. Before this agreement each case was handled on an ad hoc basis, there were no pre-emptive measures to stem the crisis from spreading. One of the main aspects of the strategy entails a $600 billion fund called the European Financial Stability Facility that could intervene before a fiscal or banking problem reach epic proportion by lending money to troubled governments and banks and buying bonds in secondary market. The new deal lends Greece 109 euros requiring the country to restructure its private debt, undertake further austerity measures and sell additional national assets. What the American media failed to emphasize is that Germany has much to gain from the euro, exports account for 80% of its economy, 42% of that from the eurozone. Allowing for the demise of the currency without efforts to save it would mean abandoning a united Europe and the largest economic bloc. The euro ties the 17 members economically, the zone includes three (Germany, France, Italy) out of the top ten biggest economies. With the sliding value of the U.S. dollar, the euro becomes an increasing reserve currency and its collapse will have a devastating contagion effect and undermine the global economic recovery. While the U.S. dollar and economy struggle, the German economy is performing well. It took a downturn during the 2008 global financial meltdown but recovered in 2010 with a vibrant growth rate of 3.6%, 2.7% estimated for 2011. Unemployment registers at 7.5%, the lowest in almost two decades. Exports climbed 14.2% last year. Germany is experiencing a self-sustaining boom. Several speakers during the RIAS June 2011 program credited Germany’s economic boom with Agenda 2010 that went into effect in 2003 under Chancellor Gerhard Schroder. The comprehensive program, among other things, cut taxes, relaxed labor laws, combined unemployment and welfare benefits, increased retirement age, lowered federal health care premiums. The overhaul aimed at getting Germany out of an economic slump after unification in 1989. These changes addressed some of the structural problems and spreaded the pain over seven years and now the Germans are reaping the benefits. An export economy relies on an adequate work force and immigration has played an increasingly important role in generating population and labor force growth. During the early 1960’s Germany faced a shortage of manpower for its economy and instituted a guest worker program for laborers from Turkey. These guests workers were supposed to return to their home country after 2 years, however, employers complained that the cost of training new workers was too high and as a result some of these workers never went back. The children of these immigrants eventually reunited with them in Germany. This group is not highly educated, speak little German and have a difficult time integrating into the host country. They tend to socialize and stay in the Turkish neighborhoods, preserve their culture, maintain strong ties with their homeland and because they straddle between two cultures, they don’t have the urge to become German citizens. Seventeen percent of Germany’s population has migration background, 2.5 million are Turks making it the largest minority group in the country and the largest in Western Europe. Germany faces a demographic challenge, its population is shrinking and aging, while Turks and other immigrants have high birth rates which provide a staple work force. The birth rate among Turks is 2.4 children per couple, 1.38 for German; that is well below the 2.1 replacement rate. An export economy relies on a lot of workers and for Germany to maintain an economic powerhouse it will need this immigrant labor force for the long haul. Furthermore, young workers are the ones who contribute to the social security system that will be tapped by pensioners. The difference in culture, religion, language and general misunderstandings create tension between the two populations. Some Germans feel that these immigrants depend on the generous welfare system, slow to assimilate, the media tend to focus on negative aspects such as crime, head scarves, religious differences, unemployment. To make matter worse, anti-Muslim sentiment rose after the attacks of 11 September 2001. But there are improvements. The later generations of Turks are born in Germany, bilingual, identify less with Turkish roots, work in the mainstream economy, and seek political representation. The fastest way to be recognized by the political class is taking on citizenship and the voting power that accompanies it. They would like to see institutional barriers removed: an education system that addresses multiculturalism in the classroom, access to employment and other opportunities. In recent years Germany recognizes itself as an immigration country and in time misunderstandings will dissipate making acceptance easier. As most fascinating experiences in my life… a great friend is the one that told me about the RIAS Fellowship. To be honest I had never really thought of Germany as a place I was dying to go to, or really knew much of its rich past. But the idea of going to learn about a new culture and country in that country was very enticing to me. So, I applied for the Fellowship thinking, if I get it and my boss actually lets me take the 3 weeks off it means this trip is meant to be. I was selected and my boss gave me the days off, perfect! RIAS had given us a list of books and movies to watch before the trip, I bought “The Lives of Others” (movie) and read Father/Land by F. Kempe. I did not have time to read the other books I bought but the movie and the book opened an appetite of curiosity about Germany that my ignorance of the place could not do before. This made me more aware of the street names and the places that I had seen in the movie and imagined from the book. I chose to do the two weeks plus the extra week in Berlin. I think it was the best choice, not only because Berlin is just an intoxicating city, but because you can indulge in it on your own pace and realize that you don’t need to be afraid to be alone in the streets of a German city as a non-white woman. I arrived in Berlin just in time for the Karneval der Kulturen a.k.a. Carnival of Cultures. I’m sure Germany is great in October, but if I were to choose again, I would choose June for sure. The Carnival was amazing, you get to see all the other cultures that live among Germans and how Berliners really enjoy all the food and music of these countries. That was a great appetizer for what was to come. The German RIAS crew was amazing; Rainer is a cocktail of great anecdotes, good advice and humor; something not really expected from a German. The schedule was pretty easy going but if you go to Germany to party first and listen to the presentations second, it will be tough, as jet-lag kicks in especially if you travel from the west coast of the U.S. The trip is a mixture of breakfast/lunch/dinner lectures, bus tours and plenty of walking. When the welcome kit tells you to wear comfortable shoes and pack light, they really mean it. As, you will walk like we don’t typically do in the U.S. with working shoes; and when it’s time to travel by train you will be hauling your luggage in cobblestone, not fun if your luggage is heavy. The speakers that are invited to the meals are usually journalists with a wealth of knowledge, but you also can get a politician from the different parties. One thing is for sure, they know way more about the way Americans do things than we will ever know about how Germans do things, unless you actually live in Germany. 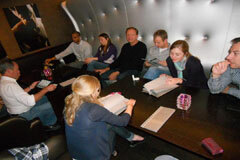 These people are very knowledgeable and usually have very fascinating topics to talk about. The second week is the traveling week. 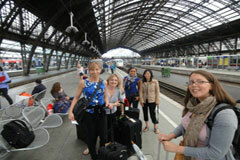 We got to go to Leipzig, Köln, and Brussels in Belgium. Besides Rainer, you really don’t need another tour guide, but one is provided every so often plus the speakers in the different gatherings. Every city we went to had its own charm about it. Leipzig for instance has so much history and importance in German history yet I knew nothing about it until I got there. Belgium, the EU and NATO was a once in a lifetime experience. Especially in June 2011 when NATO was in the middle of the Libyan issue and the EU was dealing with Greece’s crisis and Germany, our host country is the deal maker or breaker of this EU economic crisis. It was like being in the middle of the battle but in a very safe bubble. Our last day in Belgium we got treated to go to Bruges for the day, I’m not sure if this will stay in the future schedules but if it’s not and you have to pay extra for it, I would in a heart beat! This is when the second week ends and the third, for some of us, began. I liked my group but I’m used to traveling without too many people, so the third week was great for me. I had to depend on myself to get in the tube to reach my daily work assignments. Some of the people I interviewed would arrange to show me around the less touristic areas, which was like being in a different Berlin. I experienced some of the night life and day time activities that I had not had a chance on the first week. I even hung out in a protest against a neo-Nazi meeting where the protesters had drums similar to “Occupy Wall Street”. The RIAS Berlin team was always making sure you were OK and all your appointments were on schedule, even on the 3rd week. So, you are alone but not completely. They are just a phone call away to assist with anything you need. 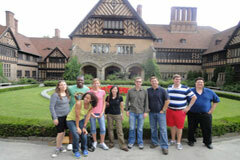 I cannot express how happy I am that I was chosen as one of the Fellows for the summer 2011 RIAS trip to Germany. This was a great experience for my professional and personal life. If you do it, please don’t see it as a free vacation to Germany, see it as a grant that was awarded to you to learn about this fascinating country, its culture and its people. The RIAS program was a huge eye opener that exposed me to people, places and situations I would not have experienced on my own. The entire program is simply fantastic, which makes it a challenge to pick the highlights of the trip to discuss here. The opportunity to talk candidly with the Ministry of Defense about the issues facing the German military was really of interest to me. I’ve covered the U.S. military in every city I’ve worked in so I thoroughly enjoyed being able to learn more about a crucial American ally. It was surprising to hear how much the nation’s history plays into the current decision making process, especially in the case of Libya which was discussed from many different perspectives throughout the trip. We left Germany with a nuanced understanding of the reason why Germany opted to abstain during the U.N. vote and why they’ve decided to stay out of the conflict in Libya. The other topic that I found intriguing was Germany’s immigration debate. The United States’ issues with illegal immigration are well known, but were surprisingly different than the ones discussed by the U.S. Ambassador and Ozcan Mutlu. In America if you come to the U.S. from another country you’re an immigrant but by the next generation you’re an American. That is not necessarily the case in Germany, as people are viewed as non-native Germans for generations even if they are born in Germany. Ambassador Murphy spoke of conversation with a waitress who referred to herself as an immigrant even though she’d been born in Germany because her grandparents had migrated from Turkey and were of non-German heritage. Mr. Mutlu spoke at length about the immigration issues as well over lunch — the idea of a dwindling population and a real discomfort with some of the immigrant groups coming into the country. From a journalistic standpoint, I really enjoyed getting to sit down with Thomas Walde from ZDF and Peter Kloeppel from RTL to hear about the differences in how the news is done. I admire the level of dedication to covering international news, as it’s just not done in the United States. The viewership numbers are remarkable compared to the declining and fracturing American news audience. Further, it was interesting to hear about the dedication to airing newsmagazine and talkshows on substantive issues over the tabloid and sensational fare we tend to see in the United States. The other great element of the RIAS experience was simply getting to go to so many places and truly get a feel for a wide cross section of Germany. I walked away having learned a lot about life in Germany that I doubt one gets by simply playing tourist. Moreover, I’d never have ventured to some of the places we went. It was remarkable. Finally, I’d be remiss in an essay about the noteworthy experiences of the RIAS program if I failed to discuss the new friendships I gained from going on this trip. The other Fellows were a huge part of making this experience so memorable. There is something very invigorating about spending so much time with so many talented journalists, hearing about their experiences, their stories, and learning from the questions they ask. They provided countless laughs, memorable moments, and hopefully become long lasting friends. 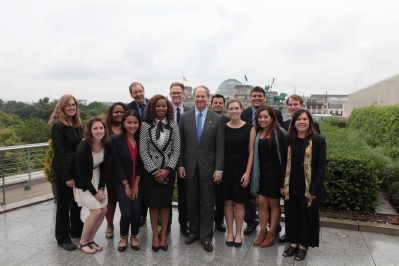 11 U.S. journalists participate in the 2-week Germany program. Some of them will extend their stay for an additional week in Germany for research and reporting purposes. During their first week in Berlin, they visited the Capital Bureau of the public TV group ARD and the private TV news channel N 24. Furthermore they met a.o. with Raimund Grafe, Chief of the Representation of Thuringia to the Federal Government, with Peter Altmaier, executive leader of the CDU parliamentary group at the German Bundestag, Dr. Bruce Armstrong, Chairman of the RIAS Berlin Commission and Minister Counsellor for Public Affairs at the U.S. Embassy and Karsten D. Voigt, former Coordinator of German-U.S. Cooperation at the Foreign Affairs Ministry. 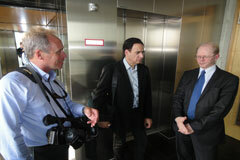 In Dresden they visited Global Foundries, a microchip producer and important part of “Silicon Saxony” and had the opportunity to talk with Dr. Georg Milbradt, former Prime Minister of Saxony, and Prof Dr. Martin Gillo, former Economic Minister and now Commissioner for Immigration Issues of the Free State of Saxony. 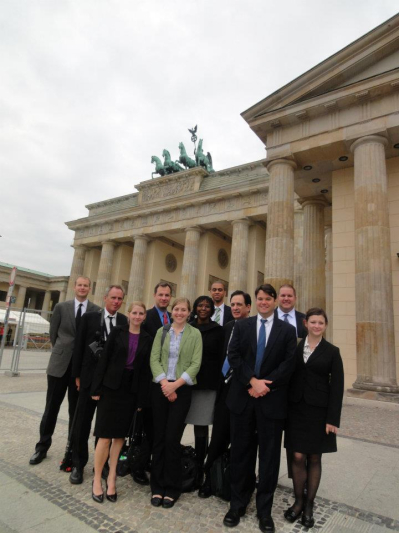 The first picture below shows the U.S. participants in the Germany Fall Program 2011 of the RIAS BERLIN COMMISSION in front of the Brandenburg Gate from left to right: Brett Birkinbine, Ed Fillmer, Amanda Larsen, Mathew Friedman, Ariana Brocius, Lynne Adrine, Thomas Warren, Frank Ucciardo, Matthew Kaulbach, Jason Husong, and Heather Contant. For many years, Germany has lived with anxiety and craved stability. Now, we are moving toward less anxiety and more stability, while America is moving into a period of more anxiety and less stability. Germans objectively are safer, surrounded by more potential friends than enemies. Americans feel more unsafe, vulnerable to terrorism, and realize they cannot assure victory (safety) through war. These comments are my paraphrase of observations offered by Karsten D. Voigt, former coordinator of German-U.S. relations at the Federal Foreign Ministry. 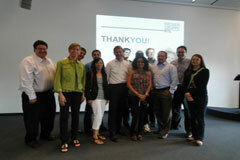 Voigt joined the fall 2011 RIAS Fellows for lunch in Berlin at the end of our first week in Europe. Since returning to the States, I have repeated Voigt’s observations to a number of Americans, including the Pulitzer Prize winning Washington bureau chief for the New York Time, David Leonhardt. Leonhardt, who was speaking to a small group of journalists at lunch, reacted sharply to the comments. “The Germans have a lot of problems of their own,” he said. “Reunification, immigration…yeah. I don’t know how stable they are.” My two weeks with RIAS would lend support to Leonhardt’s skepticism. But my own observations gave me many prisms through which to assess Voigt’s statements. I wasn’t sure what to expect from my RIAS experience. 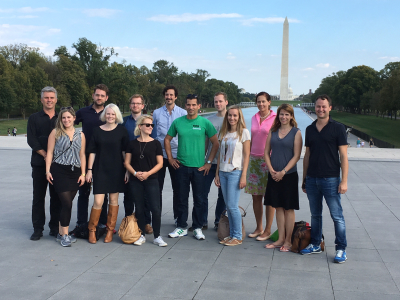 Since 2007, I had met dozens of German RIAS Fellows during their time in Washington. I always found them to be far more informed and curious about the events in the United States than most American journalists I knew, and that included those people who worked for American network television; people who might be expected to have a broader knowledge base of the world community. 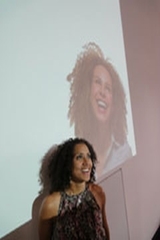 And I had my own biases about how I would be perceived and accepted as an African American in Germany. I went to college with a man who was born from a relationship between a German woman and an African American GI after World War II; he had been adopted by a black American couple shortly after his birth because his mother felt it impossible to raise a brown baby in Germany. And I knew about German’s long-standing discomfort with its immigrant community. So I had apprehensions as I boarded my flight to Europe. My first impressions of Berlin surprised me. Arriving during the state Reunification holiday gave me a chance to roam around Berlin and its citizens in a more relaxed environment. I admit I was surprised to see the various multi-racial and multi-cultural couples. I saw German men and women paired with African Americans, Africans, Hispanics, Chinese, Japanese, Turkish, Arabs and just about every other combination. Not just couples, but families with children. The numbers were not overwhelming — I’d estimate less than ten percent of the people I saw were people of color. But those numbers still surprised me. The high school history lessons about German fidelity to “ethnic purity” were assaulted. Especially walking past groups of golden brown school children who were happily and comfortably chatting and joking with each other in German. Their native tongue. Any inclination to view Germany through a “Kumba Ya,” Disney-esques “It’s A Small World After All” perspective was dispersed during our meeting with Raimund Grafe, chief of the Representation of the Free State of Thuringia to the Federal Government. I had limited knowledge of the 16 individual states within Germany, and I appreciated looking through the glossy public relations booklets Grafe gave us. I noted the pictures which included people who clearly were not of traditional German ancestry, and the references to cultural and religious diversity. However, Grafe forthrightly admitted that he would recommend that someone who looked like me should stay away from the small villages and towns beyond Erfurt and other mid-sized German cities, especially in the Eastern part of the country. He described how the on-going process of reunification had left some people — especially some young, under-educated, unattached men — feeling frustrated and alienated. Foreigners, according to Grafe, had become a target of that frustration. He said quite frankly that people with brown skin may not be safe within such communities. As I listened to Grafe, I thought about the various levels of political and social unrest playing out in my own country, as evidenced both in the Tea Party movement on the right of the political spectrum and then-growing Occupy Wall Street movement on the left. I thought about the small towns in rural western Maryland where, even now, I would avoid an overnight stay. I thought about the similarities between our two countries in their efforts and their ability to deal with uncomfortable truths. One difference that stood out for me throughout my time with RIAS was how integrated historical knowledge and perspective was for political and media professionals who spoke to us. Of course, how could history NOT be present for Germans and those who observe them? Germany has been at the apex of critical world transition and transformation. I’m embarrassed to admit how slow I was to recognize that the end of the Cold War happened in Berlin, during my adult working life. And somehow, I’d been able to push back that knowledge on my mental hard drive, without appreciation of the enormous transitions that event created for my American life. Sadly, I think I shared that lack of perspective with a majority of Americans, including our elected representatives. Clearly, the timing of our RIAS Fellowship was fortuitous. Our departure from the U.S. came just weeks after the contentious debt ceiling debate in Washington, and in the midst of negotiations between the European Union countries about the fate of Greece and the Euro. Everyone’s economic vulnerabilities, frailties and connections were playing out on the world stage. According to Peter Altmaier, first parliamentary executive director of the Christian Democratic Union parliamentary group, all of post-World War II history is based on there being an equal economic footing between France and Germany. And the recognition of that history affected his deliberations on how Germany should handle the future of the euro. Altmaier opined that the United States was not taking its debt crisis seriously, and the summer’s political face off had damaged the reputation of the world’s biggest economic power. He chastised (some) American politicians for holding on to the idea that current economic problems could be solved at the expense of the future. Metaphorically, Altmaier seemed to be saying that everyone needed to take their share of bitter medicine. Interestingly, when asked what action he specifically wanted from America to ease the overall crisis, he seemed to be stumped. Thomas Habicht, senior political editor at “Rundfunk Berlin Brandenburg,” buttressed Altmaier position on how warily Germany is viewed by its European neighbors. According to Habicht, history had caused surrounding countries to have deep mistrust of a united Germany, and in turn, that suspicion created an imperative for Germany to be more invested than its neighbors in the stability and viability of European Unity. Stability that would permit the German economy to grow without interference from other countries, because they trust that Germany sees its well-being tied to the well-being of the whole. Economic stability permits Germany to continue its work on reunification — a necessity that somewhat surprised me. I guess I was as invested as most Americans in the fairy tale of a reunified Germany: once the Berlin Wall came down, everyone lived happily ever after. Habicht reminded us of the on-going economic disparities inside Germany; the East-West divisions; the remaining fissions left by the Stasi and its vast operations throughout the country; the need to guarantee a certain base standard of living (including health care — compare that to the American debate). All of these issues cycle back to the German investment in stability and the desire to avoid the creation of a climate which might lead to political extremism. But elements already exist which may fuel extremism and threaten stability. Our meetings at Radyo Metropol and Islamic Federation Berlin provided specific illumination, and informed other meetings later in the program. Radyo Metropol executive director Tamer Ergun spoke to the issues facing his audience — second, third and fourth generation Germans from Turkish immigration status. What are the generational differences within the immigrant status audience? What are the cultural differences between those who emigrated from rural areas versus those with higher levels of education? Should the programming focus be on assimilation or embracing the diversity of Turkish culture? As an African American who worked more than 25 years in national broadcast journalism, these questions were familiar territory for me. Islamic Federation Berlin general secretary Burhan Kesici certainly disputed that assessment. 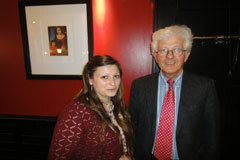 He related how he was born in Germany and earned two graduate degrees from German universities. Yet, he said he’d no longer identify as “German.” Why? Because, he said, people kept asking him if he was Turkish, solely on the basis of his appearance. Kesici and Ergun both noted that applications for German naturalization were declining, as many educated Turks saw better opportunity in Turkey. I repeated Kesici’s observations to my “blind dates,” Jutta and Ute. Ute repeated the idea that if immigrants learned to speak “proper” German and committed to education, then they would be accepted as Germans. Jutta scoffed. “They will not be seen as German,” she declared. “If I went to America and applied for citizenship, even with my accented English and my German last name, I would be accepted as American. But in Germany, if you don’t have a German name or look German, you will not be seen as German. All of this seemed so familiar to me — the experience of “otherness” in your own country, even though I can trace my American ancestry back about 200 years. I saw the similarity in the denial and the challenge of American and German efforts to handle diversity and the new world sensibility. The most poignant and personal reflection of this challenge came during a casual challenge with a member of the RIAS staff, a beautiful young woman whose features reflect her AsianPacific/German heritage. I asked her how she liked her visits to the United State. She said she enjoyed her time there, and noted how everyone assumed she was American. Again, the “otherness.” The challenge of immigration and integration formed the basis of Leonhardt’s voiced skepticism about Germany; a superficial, coded reference to Germany’s past history. Yet his comment also failed to acknowledge America’s continuing struggle to live up to the “melting pot” metaphor we present to the world. And the forced assimilation that “melting pot” implies. With the RIAS experience behind me, I find myself in agreement with Karsten D. Voigt. I think Germany’s historical awareness is leading it to move towards a more global perspective that may give it more room to grow and develop, economically and socially. In contrast, America’s capitalistic approach to globalization in the post-war era has focused more on what’s good for us, and less on what other countries believe will benefit them and make them feel safe. Germany’s geography demands that consideration; Americans have been dragged to that position in the new millennium. I think Germany gets that need for cooperation, although it may not always like it. America still needs convincing. In thinking of the best way to describe the adventure/educational opportunity that was the RIAS Fall 2011 Fellowship, another acronym kept popping to mind. RIAS reminded me of the double helix known as DNA. Like the twisting strands of amino acids and sugars that make up the DNA molecule, the RIAS Fellowship was bound up in an experience that blended both the professional and the personal. Likewise, journalism is also double helical by its very nature. For what are facts without being interwoven with personal stories? Journalism is a microcosm of life: a co-mingling of living and storytelling. The first strand of the RIAS Fellowship is the professional. 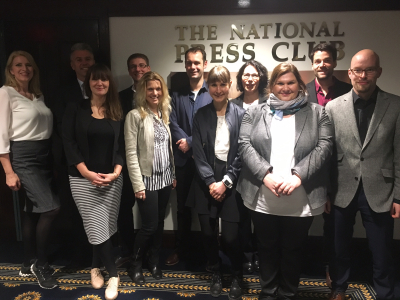 Clearly a career highlight for me was the chance to talk to German journalists about the differences between the media structure in European society versus the standards in America. The profound differences — public-supported broadcasting, slower-paced, more deliberate newscasts, less focus on social media — awakened me to what the U.S. system does better and where it lacks in comparison to its German counterpart. A public-supported television and radio journalism ideal seems to have instilled in Germans the importance of the press. Perhaps Americans would be less cynical about the media and demand better quality journalism if every U.S. household had to pay a tax to support newsgathering. It is a question well worth considering. When I returned to Houston, I put the RIAS experience to work the moment I stepped back into the newsroom. Houston is an internationally diverse city, and from the moment of my return, I was immediately equipped to write about the Euro zone debt crisis. Specifically, how large an impact it was having on both sides of the Atlantic. That knowledge has helped enormously in the ensuing weeks as the crisis has deepened, governments have fallen and solutions have been debated upon. The meetings we had with reporters and lawmakers, such as Peter Altmaier of the CDU and Raimund Grafe of the Free State of Thuringia, emphasized to me that the debt crisis was the single most important topic on the minds of Europeans at the moment. Not to mention, the talks opened my eyes to how the Euro crisis is a long-term problem that could take years to resolve. That kind of first-hand knowledge strengthens every decision I make about international news coverage; it also strengthens every Euro crisis story I write. That’s the professional, now the personal. The RIAS Fellowship also had a tremendous impact on me as an individual. Getting out of the newsroom — let alone jumping continents — is not a regular routine of mine to say the least. Venturing through three countries I have never visited before — Germany, the Czech Republic and Belgium — gave me a chance to meet people I would never had a chance to meet during the course of my normal routine. I got to discuss everything from politics to religion to journalism to food preferences with people one might assume I had nothing in common with. However, it was precisely in this foreign setting where commonalities became sharper and more distinct than the differences. The descriptions of previous RIAS experiences by my other KTRK colleagues — “life-changing,” “moving,” and “unforgettable” — all ring true. For me, the experience was a visceral one, both structural and concrete. Life-moving, perhaps? The RIAS exchange had more force than simple adjectives can do justice. Walking through the streets of Berlin, ducking in and out of the fog of history, and sharing a drink and food with strangers, is no less foundation-forming than a mason’s meticulous construction of a bricked edifice. Having the chance to experience music in the Konzerthaus in Berlin was just one example of how I felt the ghosts of Berlin come alive in amazing ways. As the orchestra played both contemporary and classical compositions, I imagined that great capital city evolving as some of history’s best writers, artists and thinkers traveled through. The busts along the high walls of the Konzerthaus are the faces of Germany’s great composers. The busts reminded me of how important the German culture has been to the global culture. The ghosts of Berlin, to me, are also the historical ghosts of war and division. As the first violinist and the guest cellist made their instruments reach a screeching crescendo, I also envisioned the city as a monument to resilience. I thought about the Russian graffiti I saw in person scrawled on the walls of the Reichstag building. Berlin has been ravaged by so much war and violence that it is hard to imagine the city that it is today. Berlin is a metropolis that could have given up; instead the citizenry appear to fully embrace its history and its modernity. I admire the Reichstag as the emblem of this intertwining of the past and the present. 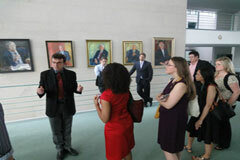 Our tour through building brought us through the modern gallery where one-half of the German parliament convenes. The central gallery looks futuristic with its blue chairs and cone of light. Yet, down the hall are words and names painted in the Cyrillic alphabet: graffiti left behind by the Russian soldiers who first entered Berlin as World War II was ending. Yet all these decades later, those words are still there; they are enshrined; they will never be erased. Turn a corner, take the stairs and you come face-to-face with the remnants of the passageway that was used to set the Reichstag on fire in 1933; an event that paved the way for the Nazi rise to power. Was it deliberate sabotage by the Nazis themselves? Or was it a communist agent who was responsible? You ponder these questions as people snap pictures with their smart phones. I visualized the uploading and updating as two strands beaming off to the web from inside a structure ensconced with the past. Then there’s the dome. The dome on top of the Reichstag building can be seen for miles (although one of the best views of the dome is certainly from the upper conference room at the U.S. Embassy). I saw that dome from so many different directions and vistas that it dominated my thinking about the skyline of Berlin. The dome is magnificent. It is a modern creation perched atop an historic foundation, which has seen century ebb into century. The dome is metallic and glass and light as air; the building is stone and imposing and strong. One look at the Reichstag sums up my thoughts and experience of Berlin. I expected to come to Berlin and experience history; I never knew the city would have so much modernity coursing through it. The other bookend of the trip — Belgium — took me totally by surprise. Brussels is a vibrant tapestry of governments and the lifestyles of the rich and famous. However, my most vivid memory was of a trip I took myself off the beaten path. I spent an hour or so browsing through a used bookstore on a side street in Brussels. I got a chance to flip through books that each told their own story and not just the story contained on the pages inside. These books were from all over Europe, and they were old. They had belonged to at least one prior owner. Some were in English, some French. They almost all had an inscription on the inside cover. To me, each name and date was the story of a person. Why did the previous owner buy that particular volume? Was it a gift? Did that book sit on a shelf overlooking some of the most important moments in history? Where did that water damage come from? Did the owner get as much pleasure from the story as I knew I would once I purchased it? I departed as the shop owner hurried me out so he could close for the evening. I left feeling a rush of excitement. I had touched mementos of the past — past lives, past stories, past sufferings, past joys. In my bag were three books that were now part of my future. I would take them across the Atlantic, back to Houston, to read. They would become mementos of me now. In a single bookstore off a small street in Brussels, I mingled my life with the lives of others. I walked away from the shop smiling, knowing that I had just experienced the blending that a program like the RIAS exchange is supposed to impart to the participants. This hour side-trip on my own was not shared with other members of the group, but in a way it was. We all had stories before me met; now we are all apart of each other’s stories. At the beginning of the RIAS Fellowship I tried to journal. I tried to record our daily activities and my responses to them. I gave up after a few days, not because I was growing tired of putting pen to paper, but because I didn’t want to waste time reflecting and bypass the actual experiencing. I knew reflection would come in tidal waves once I returned; it has. The RIAS Fellowship is something I will never forget. It engaged me on all levels. As a journalist, my eyes are opened and my ears attuned like never before. As a person, I have made friends that I am confident will remain friends for years to come. These two strands of the RIAS double helix are now engrained in me forever. I find myself almost everyday in Houston thinking about the trip and listening to the echoes from across the ocean. Yes, you really did experience all of that in two weeks. Yes, you did come face-to-face with a Michelangelo in a church in Bruges. Yes, you did whisk by a da Vinci, a Botticelli and a Caravaggio on Berlin’s museum island. Yes, you did get to meet all those amazing people. Yes, you did get to learn the ins and outs of the German media, the European Union and NATO. Yes, you got to eat mussels in Brussels (twice) and try pork knuckle for the first time in Berlin. Yes, yes, yes, we did all those things. And many more, some of which I am forgetting now but will remember later. I am appreciative to all who made it possible for me to involve myself in a program which co-mingles professional and personal growth. The RIAS Fellowship most certainly is that and does that. The RIAS trip was a phenomenal experience. I learned an incredible amount, gained valuable connections with colleagues, and came away from the trip even more convinced that journalism is the field for me. I think one of the aspects of the trip I found most rewarding was the time spent with my fellow colleagues, both in my RIAS group and abroad. Having extended, quality time to learn from others in the field, discussing similar challenges and triumphs, was tremendously valuable. Being a radio reporter, I found it interesting to simply learn more about the world of television news. Meeting foreign journalists and Americans working abroad was yet another glimpse into a similar but different world. 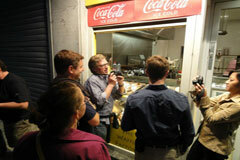 Our “blind dates” with German journalists ranks high as one of my favorite parts of the whole trip. Another part of the trip which I found interesting was the funding model for public media in Germany as opposed to the States. Here, public media relies on voluntary citizen support, as well as, to a lesser degree, that from the government and foundations. To learn that Germans are essentially taxed to pay for public media was fascinating — a model I both envied and wondered at, because it seems that could never work here. And the difference between public and private media also seemed different in Europe. 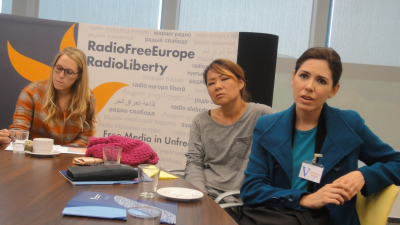 Further highlights from a radio reporter perspective included visits to the Turkish radio station in Berlin and Radio Free Europe/Radio Liberty in Prague. And the history! So much to absorb and learn. I felt as if I could hardly keep up with all the new information I was gaining, through visits, museums, talks and travel. I was both embarrassed at how shallow my knowledge of some of that history was, and inspired to learn much, much more as soon as I returned home. I think the reading material suggested before the trip is very helpful, but of course doesn’t do nearly as much as visiting places in person, or hearing it from the mouths of Europeans themselves. 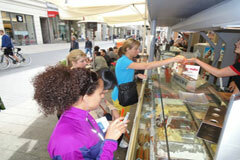 I thoroughly enjoyed each city on the trip, and felt that they each had something different to teach. Hearing about the bombing and later reconstruction of Dresden while walking around the downtown on foot presented yet another aspect of Europe’s history than the Berlin wall, for example. Finally — not unlike some other RIAS tours, I suspect — our trip occurred at a time when Europe was making international headlines almost every day. Being in the countries (or buildings, i.e. European Commission) where the fears and implications of the eurocrisis were being discussed and dealt with was fascinating, and helped me understand a bit more about the interconnectedness of the world economies, and the roles of big players like Germany and the U.S. Ultimately for me, the RIAS trip was a wonderfully inspiring and educational whirlwind tour of some of the most important parts of Europe’s past, and how those are shaping the present and future. I am incredibly grateful to have been given this opportunity, and expect some of the lessons from that trip to continue to affect my work in radio and journalism for years to come. It’s incredible how much has changed in the few weeks since I’ve come back from Europe. After great deliberation, France and Germany agreed on a plan for assisting Greece with its debt—giving it a fifty percent “haircut.” The citizens of Greece have responded to this agreement and its austerity measures by erupting into riots. With this problem partially solved the Euro zone turned its attention to the sovereign debts of other countries. Now Portugal, Spain, Ireland, and Italy have become matters of concern. “Bunga Bunga” Berlusconi even resigned as Prime Minister because of the Italian debt crisis. Reports say that the future of the Euro is uncertain, and economists fear the worst if this crisis continues. This analogy works for describing the long tedious process of coming to an agreement in the German government. After World War II, in 1949, the Allies helped write a new constitution for Germany, The Basic Law or Grundgesetz. The governmental structure outlined by this document was quite intentionally created to be complicated. This would make it difficult for one political party or charismatic leader to come into power, as was the case with Germany’s previous democratic constitution during the Weimar Republic. However, this complicated structure also makes it difficult for political change to occur swiftly. Therefore, and this is my opinion, the German government seems to devote much of its attention to working on issues that really matter to its people. It seems to work out partisan disagreements and compromise more readily than the American government. The German government’s inherent complexity demands that it move slowly, but this slow pace of government ensures stability for the people, economy and media that allows the country to thrive. This practice of moving forward slowly like a large ship in a dark sea extends to Germany’s economic policies as well. In addition to being a politically dynamic period, the Weimar Republic was also an economically turbulent time. Germany began as an exceedingly prosperous nation after World War I just like the United States in the 1920’s, then inflation went out of control and led to The Great Depression. The Nazi Party used this economic crisis as a way to appeal to German citizens and subsequently rose to power. So, you see, the desire for a stable economy in Germany comes from its acute self-awareness of its own national history. This economic stability has proved to be very beneficial for Germany ever since World War II. During the cold war, West Germany, which had been completely devastated in the war, experienced an economic miracle with the help of The Marshall Plan. Although things did not always go smoothly for the West German economy in the 1960’s, 1970’s, and 1980’s, the situation in Soviet occupied Eastern Germany was far worse. Fortunately, after the wall fell and reunification began in 1990, West Germany was in a position to financially assist the East. As I walked through the former Eastern Bloc of Berlin on this trip, I saw how this assistance took shape. The former East is now host to a number of artists, intellectuals, and businesses. In fact, there are even concerns of gentrification. As you travel farther out on the U-Bahn or S-Bahn, you see some evidence of East Germany’s difficult economic past. However, strong social service programs appear (opinion time again) to make the wealth disparity less than it is in the United States. You know, I have never seen a homeless person in Germany. I see at least one everyday in New York City. During my extension week I closely followed the Occupy Wall Street Movement in Berlin. On October 15, police forcibly evicted demonstrators from the lawn of the Reichstag. The following week, messages written in chalk on the ground indicated that some organizing was occurring, but when I went to the Reichstag, there were only a few people there. I wondered if this small turnout had to do with the lack of wealth disparity that I perceived. It will be interesting to learn how Europe’s economic calamity will unfold, and I will continue to observe these events with this frequently cited analogy for German politics and economics in mind. I, honestly, have no idea what solution could possibly be found, but that is why I am neither an economist nor a politician. However, I continue to wonder how all of this will affect the large, slowly-progressing mighty ship. Will it be swayed? The RIAS Fellowship is life changing. I can say that because my first RIAS trip to Germany in 2000 exposed me to people and issues I had little known. My latest RIAS trip in the Fall of 2011 again exposed me to behind the scenes people and issues important for an international understanding of how Americans and Germans as well as other European countries must work together. We began our tour in Berlin. 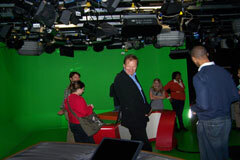 We were a group of eleven broadcast and digital journalists from places large and small. 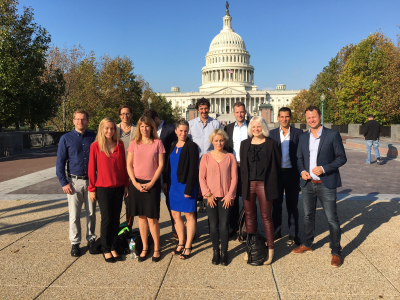 From Washington DC to New York City to a small town in Western Colorado, we toured as equals looking to learn what we could from many of the most influential and powerful people in Germany and Europe. In October 2011, Germany and France were leading members of the Euro Zone out of crisis. Our talks with government leaders in Berlin and Brussels helped us understand the complexity of the issue in Greece, Spain and Italy. But hearing the off the record stories of what happens behind the scenes of high-level negotiations is what I remember most. As journalists we all too often get just the headline, the sound bite, and the official version of the stories behind crisis like this. On the RIAS tour, we heard the rest of the stories from people who were and are making the decisions and policy. We left each session with a depth of understanding rare in our ranks as American journalists. It’s my impression from talking to my fellow RIAS tour members that meeting, listening to and questioning the persons behind the scenes at NATO, the EU and in Germanys Parliament helped each of them know there are real people making these big decisions. At NATO, we heard the details of NATO’s role in helping the rebels in Libya, the prospects of military action as their concern grows about China, Iran and other hot spots, and the crucial and delicate process of forging military solutions in a changing Europe. 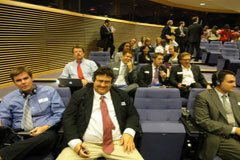 At the EU, talk was mostly about the Euro crisis. During October 2011 as we were there it was a huge story. It was changing and developing on a daily, sometimes hourly basis and had yet to be resolved. And there we were, American journalists in the thick of it. Most of the details we learned about the ongoing negotiations were off the record and not for attribution. But I think we RIAS Fellows felt awed and privileged to be so close to the inner workings of the process as it unfolded. I know I did. Meeting working German journalists and visiting their news departments enhanced our observations of developments in Germany and Europe. 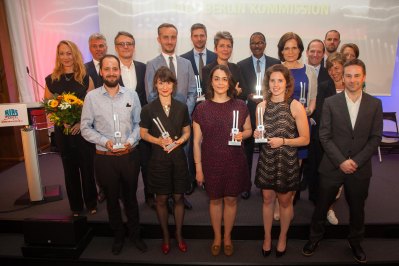 We talked to the man who started up a very successful Turkish radio station in Berlin. He saw a need for Berlin and Germany’s large population of Turks to be informed and entertained by Turkish reporters and D.J.’s. So he created a Turkish language radio station. It helps bridge a contentious gap between cultures and people. We met with reporters at ARD, Reuters’ Berlin bureau, the private video news channel N24 and other distinguished journalists who’ve covered news for decades. One told humorous off the record, behind the scenes stories about Germany’s leaders and what they’re like when letting their guards down. It gave us all a more personable glimpse behind the stern, official faces we see in public. 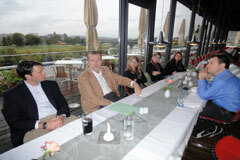 And Rias arranged for each of us to have a casual evening with additional working journalists in Berlin. It’s called ‘blind date night’. Another RIAS colleague and I went to the home of a high level executive of a popular Deutsche Welle news program. We enjoyed a home cooked meal and the company of that man’s wife and one of his colleagues, the producer of another DW news program. We visited the huge computer chip factory in the so called ‘Silicon Saxony’ and were impressed not only by their development of future chips on a molecular level, but also by the fact that almost a dozen of their top level executives and researchers sat in on our meeting. 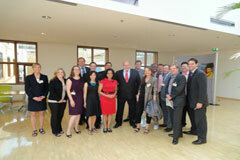 In Berlin, we had the rare chance to visit the new American Embassy and talk to high-level diplomats. I will never forget the reaction one of them had when I asked about wiki leaks. I wish I could share it publicly, but it was off the record. On this RIAS tour, we visited Prague for a couple of days, seeing the sights and meeting people with intriguing stories to share. 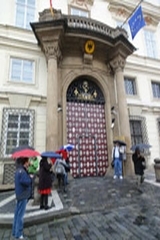 One stop was the German Embassy in Prague. Our presenter there told a story I’d never heard. During the period leading up to the fall of the Berlin Wall, dozens of Czech citizens desperate to flee communist control sought refuge in the German Embassy. Since it was the West German Embassy at the time, the Czechs believed it was their way out to freedom. We heard the stories of difficult times within the walled compound as food, sanitation, and shelter became increasingly challenging. I did not know that happened until our visit. 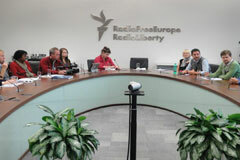 Also in Prague we visited the headquarters of Radio Free Europe and Radio-Liberty. These dedicated radio and video journalists supervise a vast network of intrepid local journalists who risk their lives to report from distant and isolated countries. Looking at their faces across the large conference room table we could see a lifetime of stress etched in their faces. They’ve been in the trenches of reporting in dangerous situations. They’ve seen their colleagues killed, imprisoned and beaten. Now they supervise from Prague a corps of brave reporters risking their lives to convey truth in troubled lands. As I looked into their faces, etched with stress, and listened to their accounts of their lives on the line in far away places I thought we Americans silting across the table from them have little understanding of what it’s like to be an intrepid journalist in extremely difficult circumstances. I am so impressed with their continued dedication. 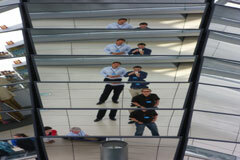 Our visit to Radio Free Europe was a highlight of the trip. But our RIAS Berlin hosts also scheduled fun events into our stay. On our first day in Berlin, we took an excursion boat ride on the River Spree. 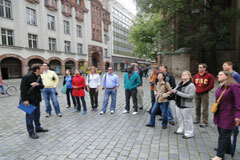 It’s a delightful way to see the historic buildings and new, cutting edge architecture of Berlin. We attended a symphony performance in an historic concert hall, a live staged variety show and many of us enjoyed the club scene in every city. In Dresden, we had a great guided tour of the newly revitalized and restored city centre and marveled at the reconstructed ‘Our Ladies Church”. But the highlight of sightseeing and being just tourists was for me our last day together. Rainer took us to Bruges, a couple of hours by train west of Brussels. 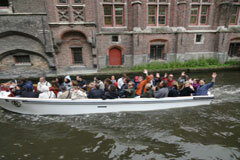 It’s a lovely medieval city with historic buildings, a beautiful cathedral and canals. It was a perfect October day, and we walked past quaint shops as horse and carriages clip-clopped by, and we glided down the canals on a small tourist excursion boat, and ended our stay on the beautiful town square of Bruges, enjoying food and drink at outdoor café’s and soaking in the wonderful European flair of a Saturday afternoon. Bruges is now one of my favorite places! I’ll go back. And I will never forget the RIAS experience. All of us who have been fortunate to take part in this extraordinary opportunity know how our lives have changed in ways large and small. I am a better journalist because of the RIAS program. Indeed, it’s changed my life. Thanks! Mathew Friedman, Associated Press, Washington, D.C. 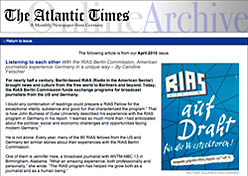 The educational value of participating in the 2011 RIAS BERLIN COMMISSION program hit me as soon as I returned to work at the Associated Press. Within the first few weeks the Euro zone crisis came to a head. In my position as an online video producer I write and edit stories based on original reporting as well as utilizing the resources of Associated Press journalists around the world. My job was to make the crisis understandable to an American audience. Through our travels and meetings with experts in Germany and at the European Union I felt I had a much deeper understanding of how the crisis came to be and what was at stake. I wrote many stories, including the fall of Greek Prime Minister George Papandreaou and Italian Premier Silvio Berlusconi, the efforts of French President Nicolas Sarkozy and Angela Merkel to hold the Euro zone together and the deals to bail out Greece and create a more stable European financial system. The knowledge I gained during the trip enabled me to draw on a richer understanding of what was happening and explain in a straightforward manner. 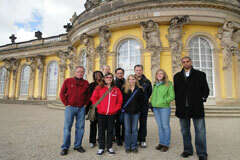 The trip also held a few surprises for my personal understanding of Germany and its people. Something I discovered in the first couple of hours after arriving in Berlin has perhaps made the single biggest lasting impression on me. It was as simple as looking down and being shown the bricks that mark where the Berlin Wall once stood. Throughout our travels in the city I keep seeing the bricks that once divided the city. They struck me on several levels. First was the German desire to remember the past, despite its painful nature. Second was the tremendous growth and development that has taken place in the two decades since the wall came down. Third was our ease in traveling back and forth across that line. A line that many only dreamed of crossing while the wall stood. As with the markers of the Berlin Wall, I was also struck by Germans’ willingness to remember the difficult parts of history. This was most clear to me during our visit to the Wannsee House in Potsdam. Walking through the rooms and exhibits describing the formation of the “Final Solution” against the European Jews, I couldn’t help but think of the dozens of my own relatives who died at the hands of the Nazis. It wasn’t an easy place to visit, but I was encouraged to see that even that dark history was preserved in the hopes that it never be repeated. 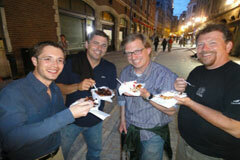 On a lighter note, I also remember my trip through the great food and German and Belgian beers I got to try. From the Currywurst I ate moments after arriving at the Unification Day celebrations to the Wiener Schnitzel and Sauerbraten I enjoyed on more than one occasion, it was all remarkably good. I did, however, skip the Currywurst-flavored potato chips. Finally, I remember the camaraderie of my fellow journalists. Before the journey, I was a bit nervous about spending two weeks with a group of people I didn’t know. But those fears were allayed in the first few hours. Everyone was friendly and interesting and I’m glad I got to spend the trip getting to know them. “The clear motor of Europe is Germany,” stated Paul King of The NATO Review. 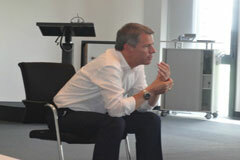 That much was clear throughout all of the meetings during our RIAS BERLIN COMMISSION program. But, to have it summed up in such a nice package during our final meeting — a luncheon at NATO in Brussels — by an Englishman, made it clear that it is up to Germany to lead the way to solve the Euro debt crisis. It is a responsibility placed upon their shoulders and on their bank accounts. But it is one the country appears to do with begrudging pride as they show Europe and the world what Germany truly is. 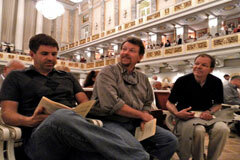 Twelve years ago to the month I was in Germany for my first RIAS BERLIN COMMISSION program. The largest issue of discussion in our meetings at the time was still German reunification. Now, arriving on the 21st anniversary of German reunification, the issue of union — a currency union — spread far beyond Germany’s own borders. Germany did not create the problems, but it was up to them, the largest economy in Europe, to fix it and keep the union together. I stood in front of the Reichstag building in Berlin, amazed at what I was seeing. Over a decade ago the mall in front of the capitol building was littered with construction equipment and pink water pipes carrying the ground water away. Today, it is a beautiful grassy field with completed government offices and space for Germans to take pride in being just that — German. In essence, it typifies how far the German people have come in the twelve years of my absence. In 1999 the common European currency, the Euro, had not yet been issued. It was in place in theory, but not available for the people; currencies like the mark, the franc, and the drachma were still being spent. Today, there is talk of reissuing and evaluating such units and recalling the Euro. But, amongst the discussions and arguments, Germany stands as a pillar of strength for the European community. This is a dynamic step forward from where they stood over a decade ago, as they were still trying to find their strong voice. Throughout many conversations with politicians, business people, media professionals, and people I met on the street, I came to understand that the German people first cleared their voice and spoke up proudly of themselves when they hosted the FIFA World Cup soccer tournament. Finally, after so many decades, they finally felt free to once again express pride in their country. It may have taken decades, but sport helped bridge an identity gap that Germany could not cross on its own. Now it appears to be completely united and as strong as any other country in the world — often times stronger. And that could not be more important today, due to the sovereign debt issues across the globe. The professional meetings our group attended gave us as many perspectives as people we met about what needs to be done when it comes to issues with the Euro — particularly in countries like Greece and Italy. But, despite so many varying viewpoints, one thing was clear: it falls to Germany to lead the continent through the crises other countries have created. And it is obvious, amongst all of them, that the German people are proud to lead the way as a positive and proud new example of what it is capable. It is difficult to learn about the complexities of any culture or nation in just two weeks. And I haven’t tried here to pretend to be an expert on such vastly complex issues. But what we did see, hear, and understand during the RIAS BERLIN COMMISSION program is quite obvious: Germany is the cornerstone to Europe’s recovery. They are also one of a few key players to the global economic recovery, since many other nations, like the United States, are relying on others to move forward so they may also find it possible. Germany has now proudly found its voice. Twelve years ago it was that of a shy giant who was willing to do the work, bearing the guilt of decades long ago in order to better serve Europe. Today the tone has changed to that of a new image of a modern Germany. They have found their strong voice and have unquestionably become the leaders of Europe. An English journalist indicated as such at a NATO luncheon, and it was just as obvious to a group of American journalists learning about the Germany and its place in the world. 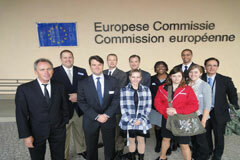 A once-in-a-lifetime trip that allowed me to witness an unprecedented period in the history of the European Union. That is how I will always remember my RIAS experience. 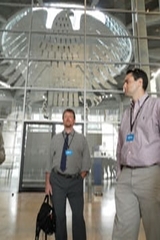 I’ve told family, friends and colleagues that I believe even a veteran news person in the business for decades would be hard pressed to come up with an itinerary that could rival the one organized by RIAS BERLIN COMMISSION during my two-week visit. From start to finish the experience was amazing. The breadth of the program is extremely impressive. The people with whom we met were as varied and diverse as Europe itself. Our ability to interact with each special guest — ask questions, answer questions, raise points, take issue — made every engagement unique. Each meeting was accentuated by the fact our daily destinations allowed us to see a new part of our primary host city — Berlin. I really felt Berlin’s dynamism as soon as Rainer took us on a boat tour on the River Spree our first full day of the program. With beer in hand on a crisp and bright autumn afternoon the city’s history and modernity intertwined. That afternoon lent itself to a feeling of anticipation about what lie ahead for us over the next two weeks (or three weeks in the cases of some lucky participants). During our week in Berlin I grew very attached to the city: its aura, its energy and its people. How it reemerged as a political and cultural international hub in the wake of a disruptive past. That all became apparent as we met with current political leaders like Germany’s equivalent of the U.S House majority leader and a former Foreign Ministry official; as we toured the Reichstag, the U.S. embassy in Berlin, the Berlin Wall memorial, a major TV station and explored a predominantly Turkish neighborhood. 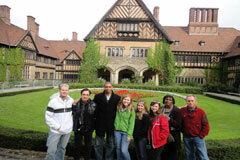 Or as we listened to a symphony at a local concert hall followed by an authentic German meal at Lutter & Wegener. A particular highlight for me was the RIAS “blind date”, where each of us is paired with a German counterpart who’s done the program-equivalent in the U.S. It’s a relaxed evening with someone with whom you feel like you have an instant connection, not just because you both work in media, but because he or she is also part of the RIAS family. They know what it’s like to be in a foreign but intriguing new environment. And they really make you feel right at home. My host and I still exchange occasional emails. Also, touring the public and private TV stations and speaking with their employees provided me with a sense of Germany’s news media culture. One observation that struck me is it does not seem as self-promotional as in the U.S. Where viewership is often driven by personality as much as content here, in Germany that almost seems frowned upon. Many reporters or anchors don’t even have a following on social media like Twitter. That seemed a bit surprising to myself and some other fellow Americans on the trip given America’s interactive environment and how it helps define a so-called personal brand. 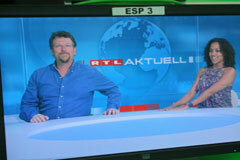 But I think it spoke a lot to what Germans believe is the “essence” of news and how it’s supposed to serve the viewers. It will be interesting to follow how this cultural mentality proceeds as technology continually evolves. There are so many things about Berlin that struck me. One is its connection to America, particularly its role as defender during the Cold War for the then residents of West Berlin. That was evident walking past Checkpoint Charlie, touring the Berlin Wall Memorial and even the prime real estate on which the U.S. embassy is located. As much as the Euro Zone crisis was the day-to-day news event, the strong but sometimes strained U.S.-Germany relationship is a welcomed undercurrent to the program. Oftentimes only a good friend can compliment you on your strengths while simultaneously criticizing you for your faults. After listening to several thoughtful presentations and discussions during our trip, it became apparent the two countries have a similar relationship. Beyond Berlin the trip maintained the high standards with which I felt I’d been spoiled with the first week. Dresden, Prague, Brussels are all deserving of their own individual composition. But for the sake of time I’ll sum up my highlights. The walking tour of Dresden (including the Dresden Frauenkirche) should not be missed. Dinner later with Dr. George Milbradt was fascinating as he explained the Herculean effort of essentially reinventing government in the former East German state of Saxony. 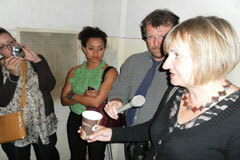 Touring Radio Free Europe in Prague (and getting temporarily lost in the city afterward) was great. I also enjoyed going to the German embassy there and learning of its pivotal role in the events leading up to the fall of the Berlin Wall. 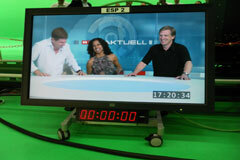 I have to conclude by pointing out how the program is anchored by three terrific people: Rainer, Isabell and Lisa. You are the vital trio acting as the program’s heart. You kept the enthusiasm levels pumping throughout the journey. Danke! 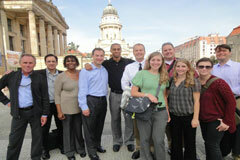 My trip to Europe with the RIAS Berlin exchange program was something I will remember for the rest of my life. Not only did I collect remarkable information about Germany’s culture, government and media, I also gained professional experience unattainable by staying in the United States. The buildings and organizations we visited, the speakers we listened to and the stories we heard changed my view on the world. The opportunities have reinforced my reasons for pursuing journalism. One of the first things visitors notice in Europe is the people and their culture. The people in Berlin were very informed about and intrigued by what is going on in their country. I admire this. As a recent college graduate, I am shocked by how many people aren’t interested in politics and the issues our government is facing. In Europe, just about everyone I met had an opinion and wanted to help and strived to make their country the best it could be. This patriotism is proof of how Germany was able to reunite as one country. Although its culture has had many struggles, Germans have their own identity. Germany is a hesitant nation, second-guessing almost every move it makes. This is evident even in the family life as well. Parents and children do what they’re supposed to. They go to school, have a job and try to get through life without running into major troubles. 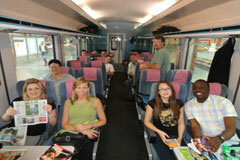 The German culture also allows people to enjoy their life through strong family-oriented values. Companies take care of employees and every person cherishes the free time they have with friends. This is one thing I think Americans can learn from the European culture in general — slow down and enjoy life. Another aspect of the German culture that has made a lasting impression on me is how its government works. I know the U.S. highly values democracy, and we should. But when we’re in situations like our current debt crisis, and not getting anywhere, we could take a few pointers from the German parliament. The European Union is going through a similar situation with a debt crisis of its own. The EU’s problem is different than the U.S.’ because the EU has several countries and several different leaders trying to work together to come up with a solution. In the past month since my return, EU leaders have found solutions. Being the most stable country in the union, Germany plays a major role in these decisions. The way their government is able to work together and make a decision impresses me. Yes, they have the so-called “easy way out” where if a decision isn’t made, the parliament goes with the ruling party’s solution. But this barely causes rifts in its government. The way our Democrats and Republicans have the hardest time working together is embarrassing. Recently, the U.S. cabinet was unable to come up with an agreement for budget cuts in time, and now every American will feel the effects because the chosen people in our government can’t work together. Maybe we should mimic Germany’s political system and implement the majority party’s solution. At least it would be saving millions of Americans from suffering through the consequences of our country’s debt. Clearly, I learned about differences in the types of governments and how each country is impacted based on its chosen ideology. Finally, one of the main reasons I was on this trip was to learn about media in Germany. There are several similarities when comparing it to the United States; however, there are some big differences. Similarities include how news is reported in the paper and on air, the stories we choose to publish and reaction from the general public. The differences are thought-provoking. The U.S. is a bit more advanced in instant access to news. We use Facebook, twitter and the web as a medium more than Europe does. European journalists tell us they see this changing in the future with instant access to news. Another difference is how much we report on foreign countries and political affairs. In Germany, news organizations are constantly reporting on happenings in the U.S. The U.S. rarely reports on news overseas, except maybe a quick update on the current EU crisis and world stocks. I think reporting on news worldwide is important. It’s obvious when talking to the German people that they know not only what is going on in their own country, but in the U.S. as well. The United States is lucky to get half of its population to keep up to date with information on their own country. I noticed this when traveling to Australia as well, and this is one of the things I would like to change as a journalist in the United States. It is important for Americans to not only follow national news, but to also stay informed on world-wide events. 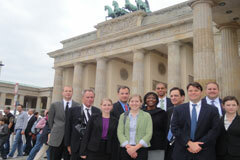 Overall, the RIAS BERLIN COMMISSION was one of the greatest learning opportunities of my life. By going through RIAS, I had experiences that would not have been available as an individual tourist. The personalities in our group of journalists also made the trip memorable. The people are connections I will keep for a lifetime, personally and professionally. I learned about the people of Germany and Europe, I learned about the German culture, I learned about the German government, and I learned about the German media. All aspects of the opportunity will stay with me for life and will benefit my work. Through my work, I will contribute the knowledge I gained to help my employer continue to grow as a well-rounded news station. The RIAS DERLIN COMMISSION Fellowship has provided me with unique learning opportunities that have translated into terrific tools for the work I do as a correspondent covering international affairs. As a previous RIAS Fellow, I sort of knew what to expect, but my expectations were exceeded by the program’s schedule and the fascinating people we met. The timing of the fall program of 2011 was fortuitous, because I was doing a story on the European Debt crisis. During my visit to Berlin, I was able to interview Peter Altmaier, first parliamentary executive director of the Christian Democratic Union parliamentary group. This was incorporated into a live report from Berlin for CBS and also used in another story that included Germany’s United Nation’s Ambassador Peter Wittig. I want to thank RIAS Fellow Ed Fillmer for his help and the terrific professionals at NT24 who graciously assisted in feeding the video back to CBS headquarters. The “Blind Date” night was a new and welcome wrinkle for me since my first RIAS trip. It really gave me a nice taste of what life is like for our German counterparts. Their quality of life and work schedule seemed a lot better than what many journalists have in the U.S. 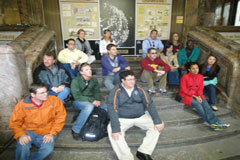 The Fellowship program is a journey that is rich with invaluable professional and personal experiences. I was excited to see Berlin again and all the changes in the skyline since my last visit there. It will always have a special place my heart. I wish we had spent more time in Prague; there was so much to see and learn — not to mention RIAS’ very own Ghostbuster Lisa and the Haunted Hotel! Brussels and Bruges were also on my prior trips and remained delightful. The European Union and NATO were of course important stops for me because of my daily beat at the U.N. It’s interesting to see that EU and U.N. officials look at each other with great skepticism. All of my RIAS visits to Germany have provided me with a better understanding of the geopolitical world I work in. This trip was a reminder that it’s important to go back to Germany to get updated on its role as the Economic Engine that drives the European Union and see its remarkable and positive influence on the future of the world. I am extremely grateful to Rainer Hasters, Isabell Hoffman and Lisa Ziss for their support in making this a successful trip. I feel very fortunate to have been in their company and to have met so many wonderful new colleagues. Thomas Warren, WTOP, Washington, D.C. 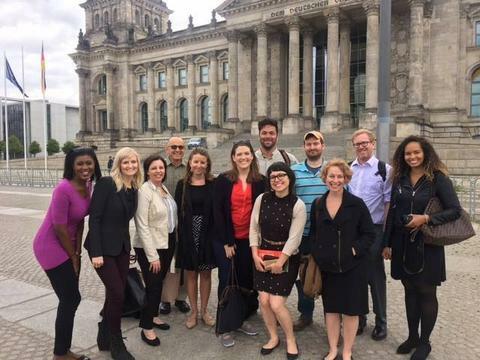 When my colleague, and RIAS Fellow, Kate Ryan told me the RIAS experience would be one of a lifetime, I went to Berlin with high expectations. They were exceeded in every capacity. I consider myself lucky to now be a RIAS Fellow. The program is setup to give a full experience, and that’s exactly what we came away with. For example, to sit down with Peter Altmeier from the German parliament in an open discussion, and get intimate details of policy talks between European nations about how to handle the Greek debt crisis was incredible. It’s one of the highlights I’ve taken away from the trip, and there were many. However, in all of our meetings, whether they were with officials, such as the former Prime Minister of Saxony Dr. Georg Milbradt, or journalists like Gabi Kostorz from ARD-TV, to have an open forum to talk about how policy decisions are made, or how stories are told, they were invaluable. I also came away with a greater amount of respect for the news business in Germany. Watching some of the news shows from Berlin, such as the great Tagesschau program, it was refreshing to see hard news stories, those happening both in Germany and around the world, dominate the coverage. The N24 news organization is an operation that seemed to pride themselves on their hard news coverage. 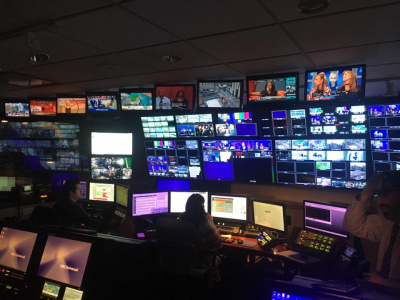 So, it was a thrill to get a behind-the-scenes look at how they go about news gathering from their many bureaus around Europe. As journalists in the U.S., I think, we sometimes feel our news judgment is the model for the world. It’s not. Participating in the program brought me to Europe for the first time. So, every city we traveled to, from Berlin to Brugge, was the most beautiful I’d ever seen. 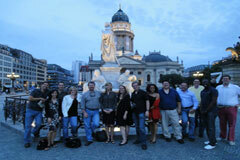 What made the RIAS experience so great was being able to experience each city. I mean, I don’t know when I’ll ever have another chance to get a view of Dresden from atop the Church of Our Lady, or be mistaken for President Obama inside the presidential castle in Prague. Those are once in a lifetime moments I’m grateful I’ll have in my mind forever. Like my other fellows, I found out about the RIAS Fellowship through a colleague who participated. We all wondered why we had never heard of it before. We figured it’s because the program, and experience, is so special that it’s only extended to those who previous fellows feel would benefit most from it. Having been through it, I, too, now hold that mindset. We consider ourselves part of a special fraternity that only a select few can be part of. I’m honored that my colleague Kate Ryan felt I was worthy to be a fellow. I was also lucky to be in a group of 10 very special people. We may work in different parts of the country, but Lynn, Amanda, Arianna, Heather, Jason, Frank, Ed, Matt (a.k.a. Matt Fox), Matt (a.k.a. Matt AP), Brett, and I are now extended family. The reason I can document how incredible an experience the fellowship was is because of our leaders Rainer Hasters, Lisa Ziss, and Isabell Hoffman. I can’t imagine what RIAS Fellowship would be without them. They put together an amazing three weeks of meetings, sights, travel, and unforgettable memories. Rainer’s enthusiasm, and hardy laugh when he told a good joke, was infectious. Lisa, with her calming sense of urgency, was the reason we never missed a train, a bus, or a flight (though she doesn’t like to take pictures). Then there’s Isabell. She was my guardian angel. For two months she dedicated her time setting up a week’s worth of interviews for my HIV/AIDS research project. She put me in touch with the top doctors and government health officials in Berlin who work in HIV/AIDS research, and allowed me to sound smarter than I am with her information gathering. She also managed to help this foreigner, who is bad at navigating directions, get around Berlin by bus, train, and cab without any problems. That may have been her greatest feat. Isabell I am forever indebted to you, and I thank you. Simply, I am privileged to be able to call myself a RIAS Fellow.